Joe at WM Pizza and Donuts – and Dates! 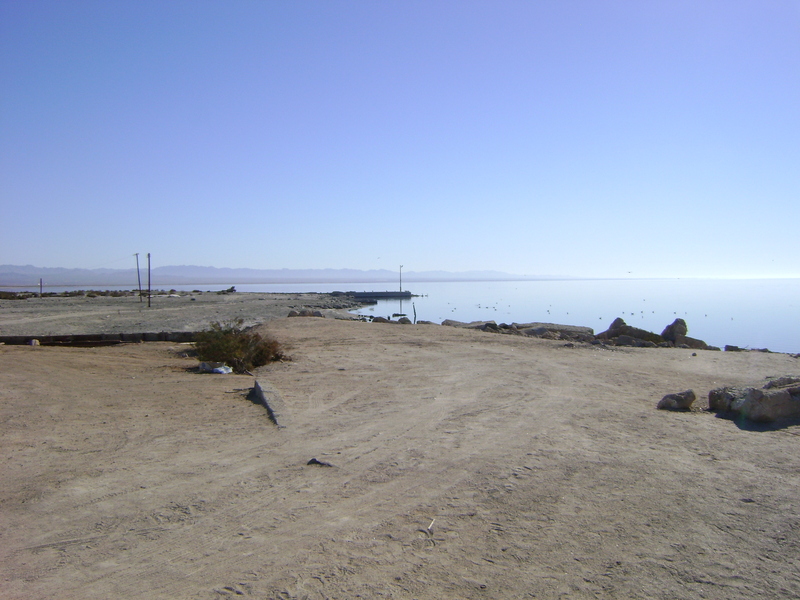 There are not many places to eat around the Salton Sea. So as I was driving around and I realized it was getting to be about 6:30pm, I started to look for food. I pulled out my phone and Yelped the area around me. One place came up, WM Pizza and Donuts, that had excellent reviews and I decided to give it a try. Next thing I knew an older guy appeared at my window. His name was Joe. He asked me what I wanted, asked me if I was going to be around tomorrow, which I wasn’t, and then invited me to make me a pizza. I was shocked, but super happy! Who does that? No one in LA. 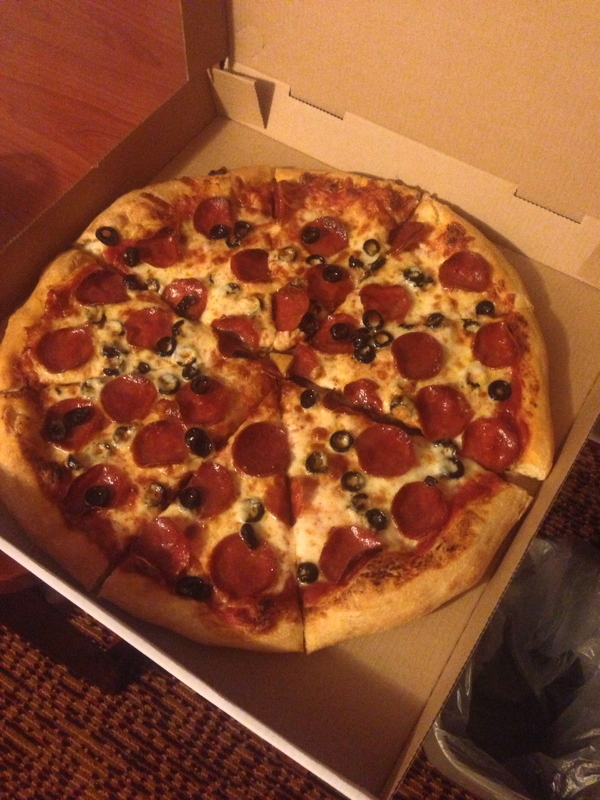 I walked into the pizza shop and he invited me back into the kitchen where he made my pizza right in front of me, pepperoni and olives! We talked while my pizza cooked and Joe explained to me that he opened the store over a year ago and that things were hard at first, but getting better as the year progressed. He also surprised me when he said that he gets most of his business from people that are out of town since Westmoreland, CA only has about 1,000 citizens. It seems as though he has been trying to accommodate the locals and at the same time keep his roots true so hopefully they will help support him as much as they can. 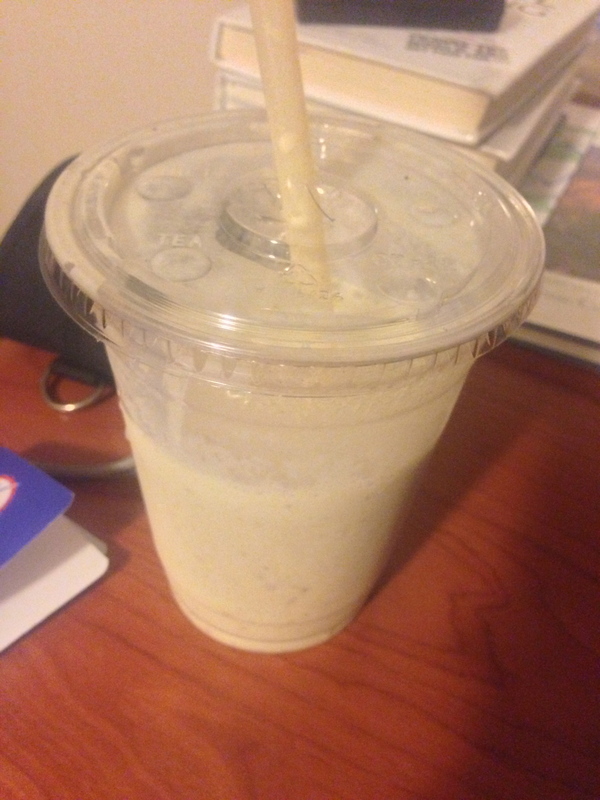 Joe handed me my pizza and then offered me a date milkshake for free. I told him that I didn’t even know if I liked them and he said that they are the only place around that makes their’s fresh per order. 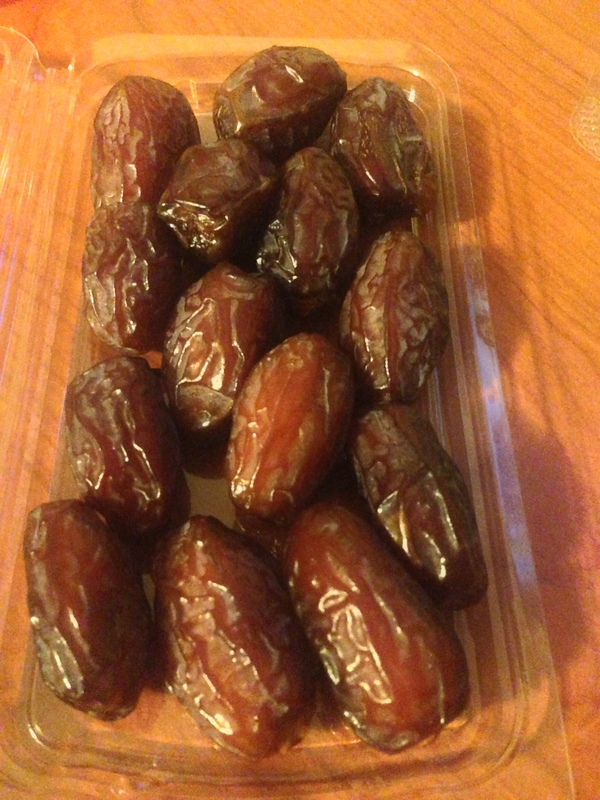 They pit the dates and then make the shake right at that time. A lot of places pit a bunch and then make a large amount of milkshake that is distributed from a machine as the day progresses. It was amazing and had I been around later the next day I would have went back to get another. 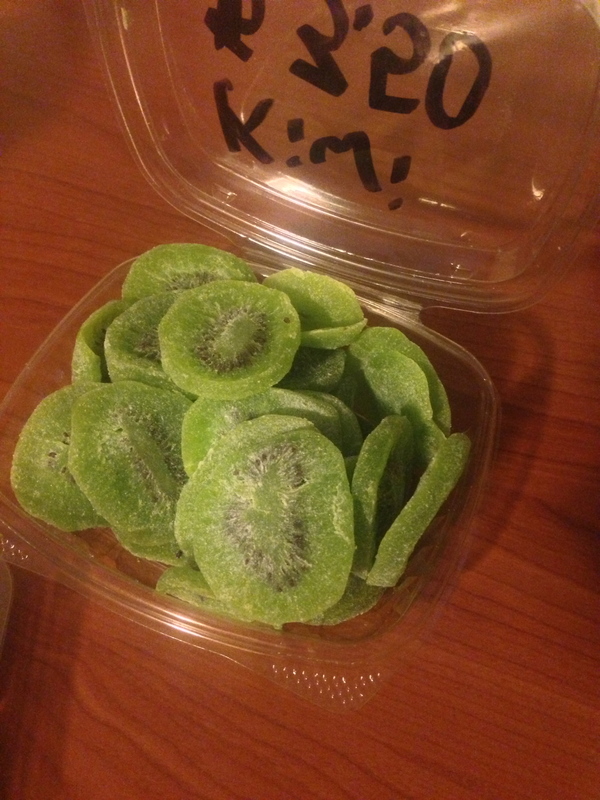 I grabbed a drink and some dried kiwi and Joe threw in a small container of dates for free too. No freaking way was all I could think as I left his store. Best night ever thanks to Joe at WM Pizza and Donuts! 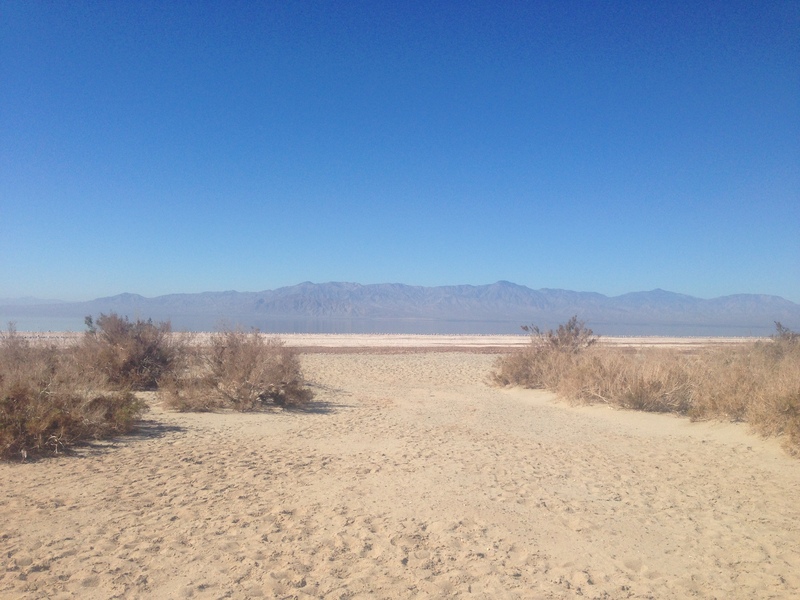 Wandering down dirt roads I came across the Sonny Bono National Wildlife Refuge and decided to check it out. Of course, the visitor’s section had recently closed at 3:30pm so I walked up the wooden overlook to see if I could see any birds out in the field. I put my eyes into their binoculars, but I couldn’t see any. 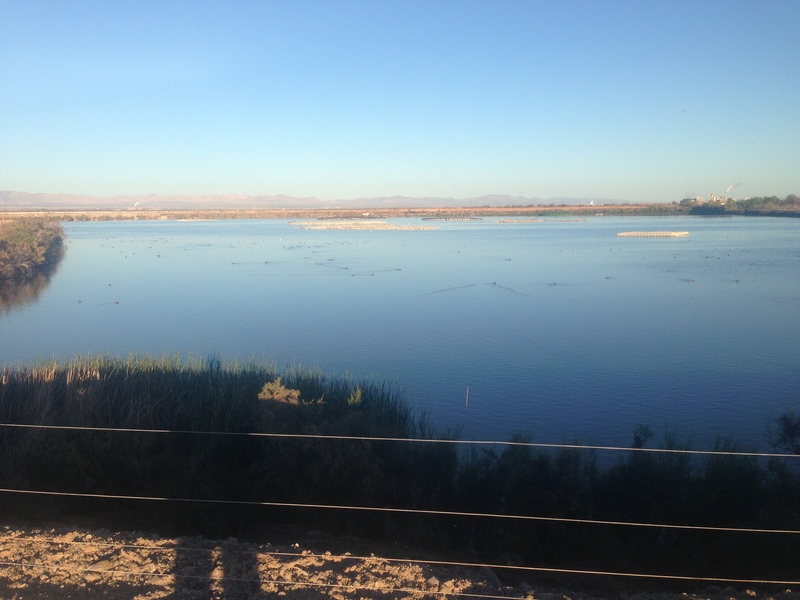 I had heard that this was another spot to view birds but the information posted around the refuge was more about the disappearing lake and the wildlife supported by it. 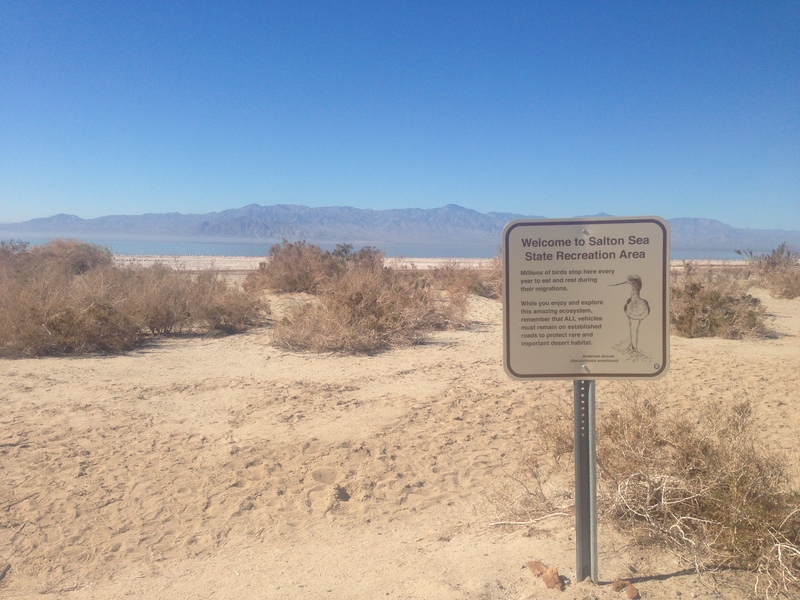 As I started my trek and followed their signs pointing the way to Rock Hill Trail, I took in the views and learned more about the Salton Sea. The trail started out down a long path next to bushes and an elevated dirt road. Reaching the end of the section the path opened up more and continued between the beach and grassy, a man-made area followed by what looked to be a man-made lake. 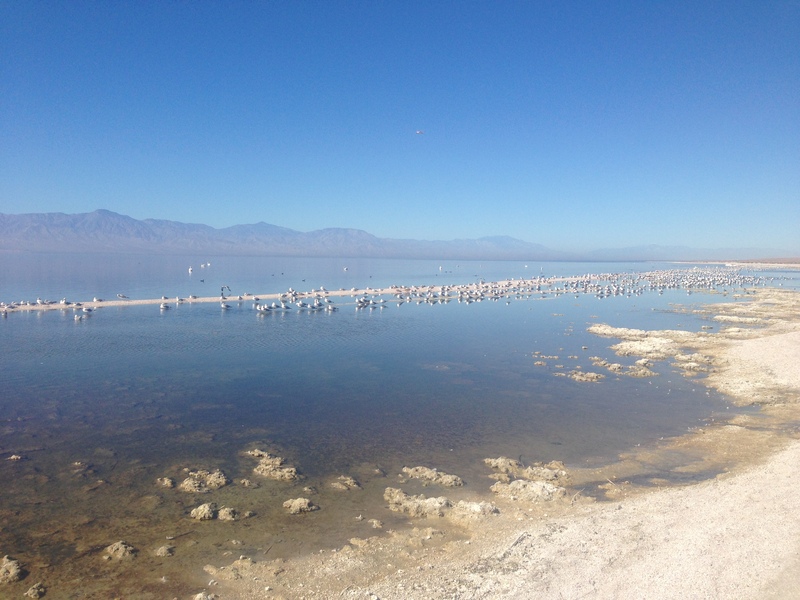 There were birds scattered along both sides, grazing and moving along to their next meal. 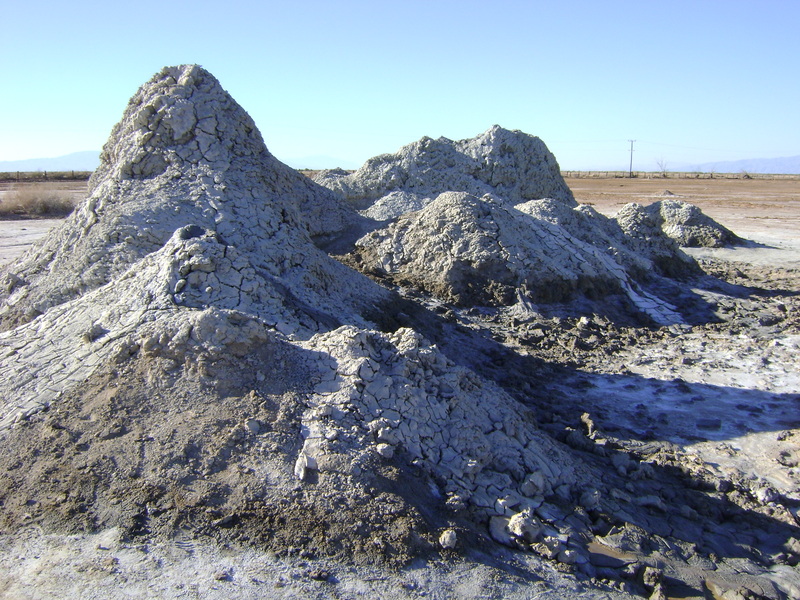 The Salton Sea’s shores consist of barnacles, which are seldom found in lakes but were inadvertently deposited during WWII when sea planes practiced landing and taking off there. It is also currently 25% more salty than the ocean. 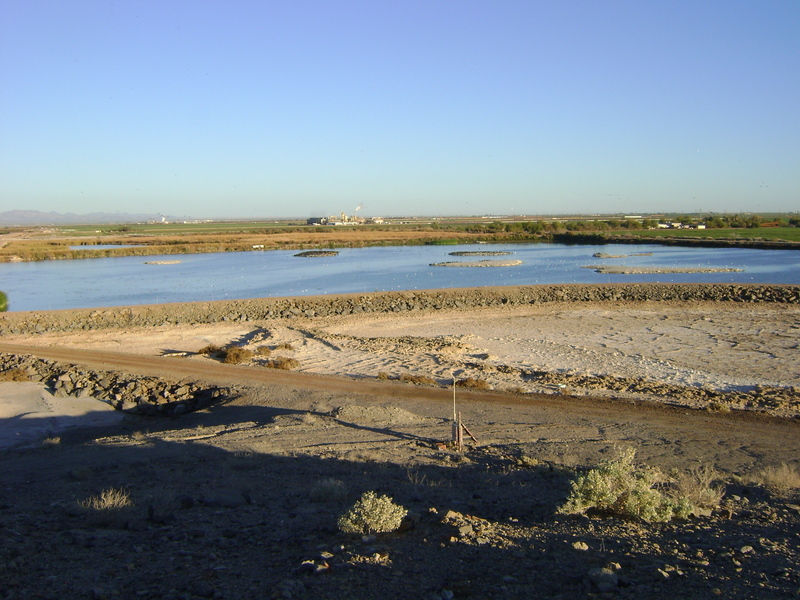 Different species of fish have different tolerant levels to salinity, but if it’s levels continue to increase it might one day become too salty for any fish to inhabitant, throwing off the whole food chain that birds and other species depend on for survival. 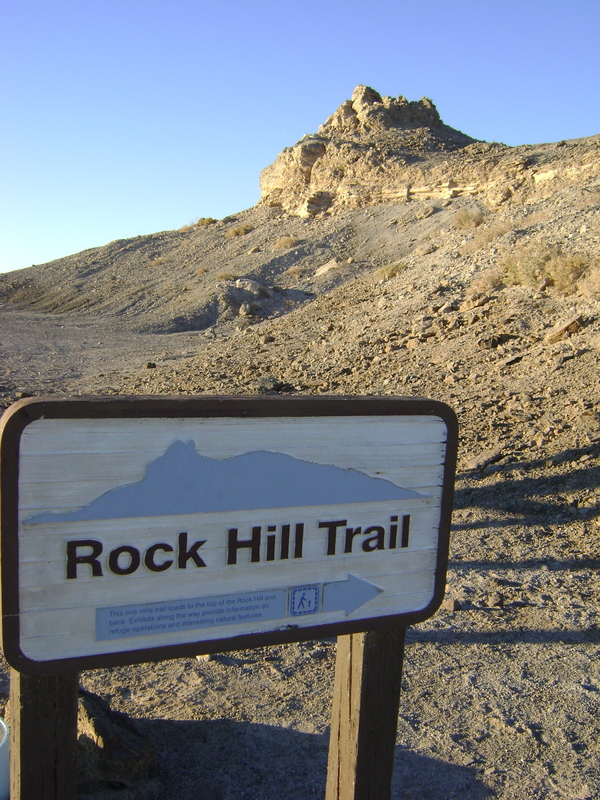 I reached the base of Rock Hill Trail and decided to power up it. I was on a mission. I zigzagged up and reached the ending point in only about 5 minutes. I was a little disappointed. I expected to be able to go all the way to the top, but there was a barrier preventing me proceeding any further. I guess they don’t want people falling off into the lake. The view however was amazing. Surrounded on all sides by different and equally beautiful scenery. 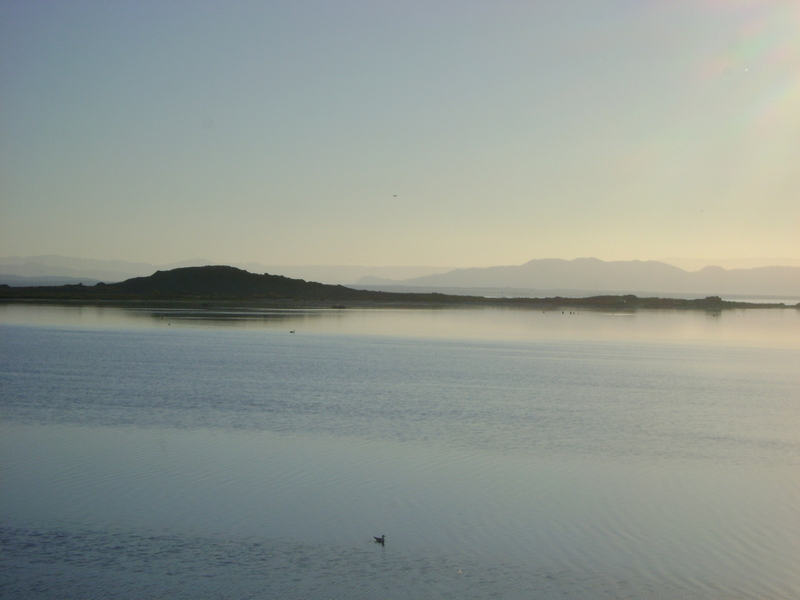 To one side was the beach with birds grazing and the sun growing closer to the lake, to another was a stark landscape completely bare, empty, dried, dead desert, to another was a small lake inhabited by birds on tiny green islands, and to the last side was bright green wetlands. I took a moment to take it all in. The short hike to an amazing viewpoint was worth it. 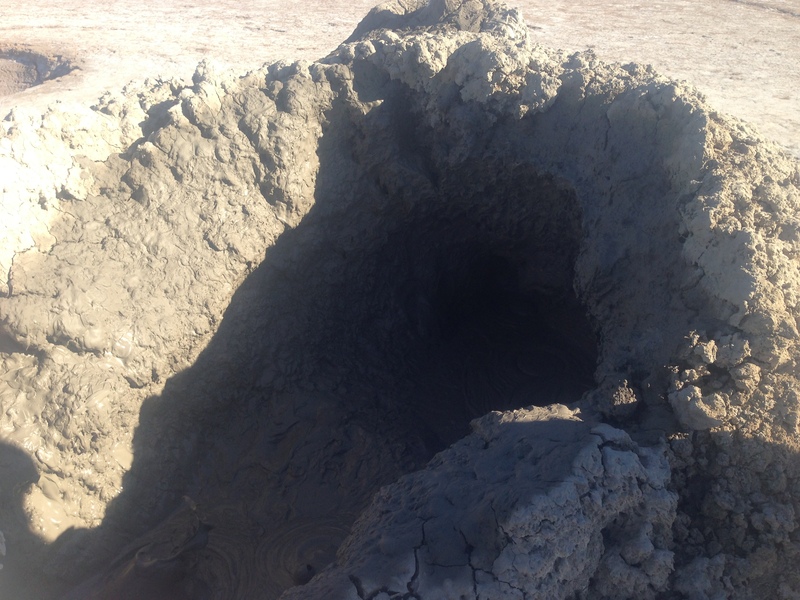 These bubbling Geothermal Mud Volcanoes at the Salton Sea were so cool! I put in the address to my GPS and followed it until I couldn’t anymore. People had said that they were a far walk and I wasn’t exactly sure what I was looking for so I turned down a street and started to drive. I saw a rabbit and a roadrunner. I decided I must have missed them so I turned around and drove back to where I was. 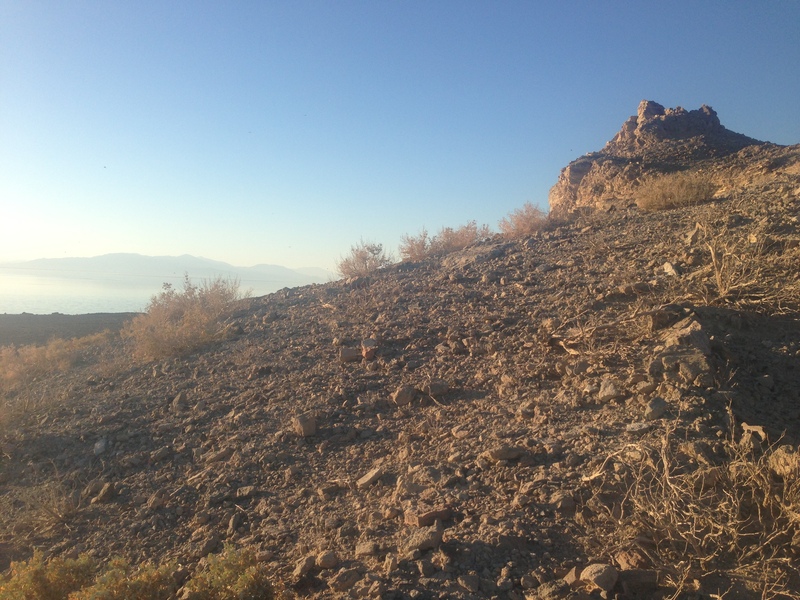 There was a car along the side of the road with two people coming back from these small mountains. That must be them. 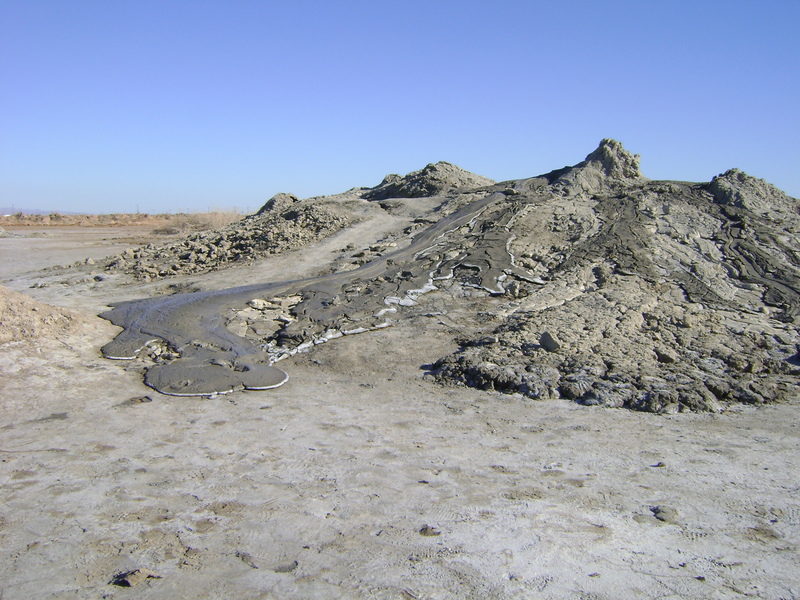 I walked out across the dirt to the small mountains of mud. I could hear them plop and bubble from a good distance away. It was so funny. 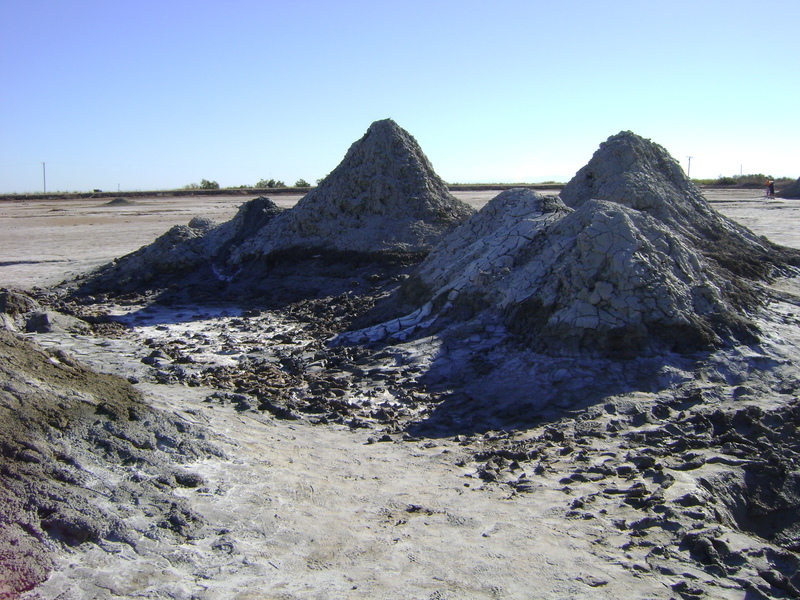 The big fat mounds made low sounds while the skinny closed mounds made higher crackling sounds. 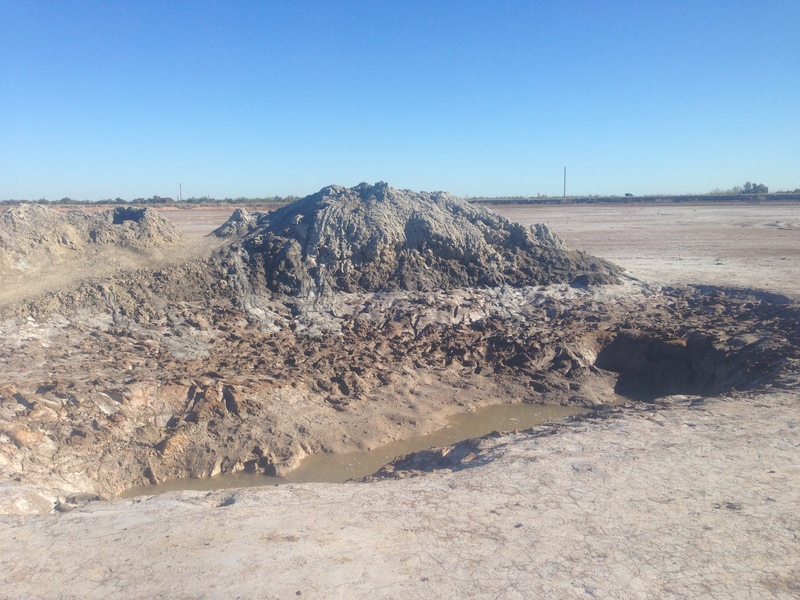 They all had little pools of water or mud at their bases. 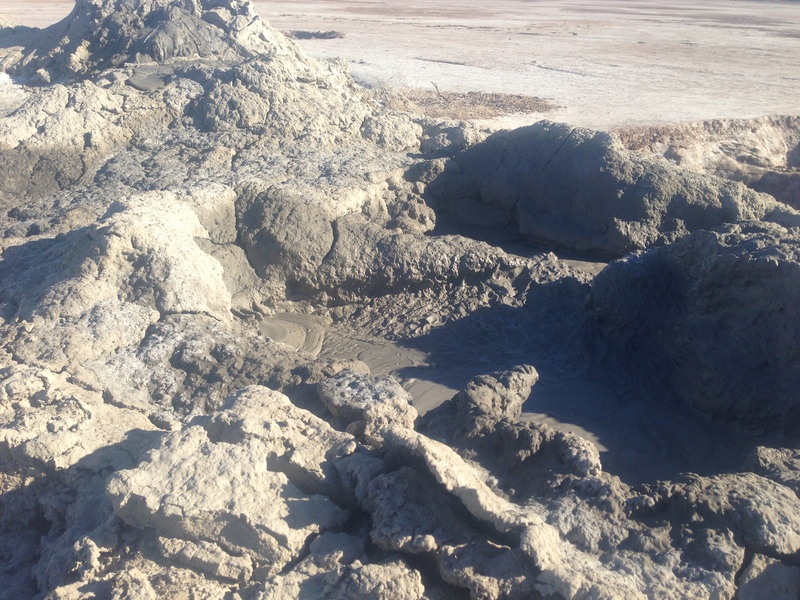 The ones with water were bubbling ferociously while the ones with mud were much slower and more relaxed. A couple and their dog joined me. We talked a bit while exploring, going from mountain to mountain, not getting to close for fear of falling in, getting stuck, or the earth falling out from underneath us. The man kept saying that they were not the ones he had been to before, but we didn’t see any others anywhere near us. We walked around some mud and their dog stepped in it leaving little paw prints. We walked up the non-water side base of one and reached in to feel the heat. 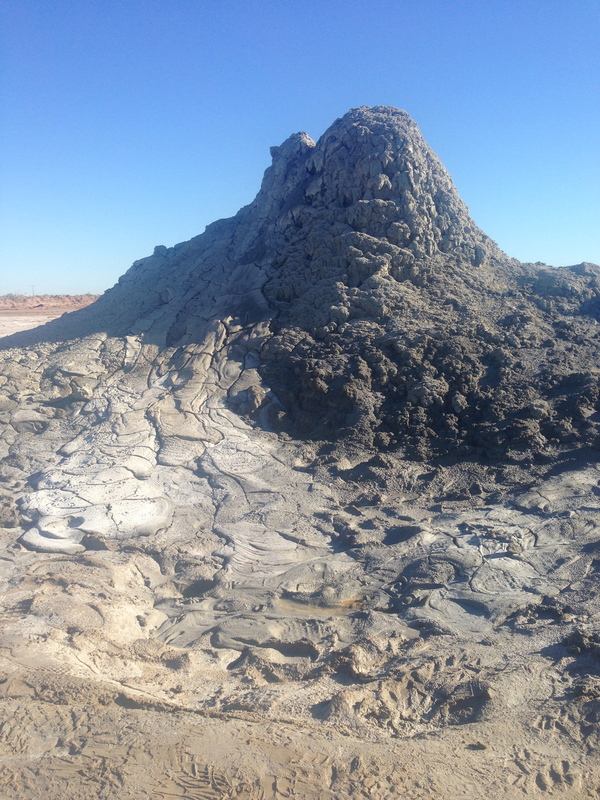 Nope, this one is cool, but the next ones we came across had steam rising from them. 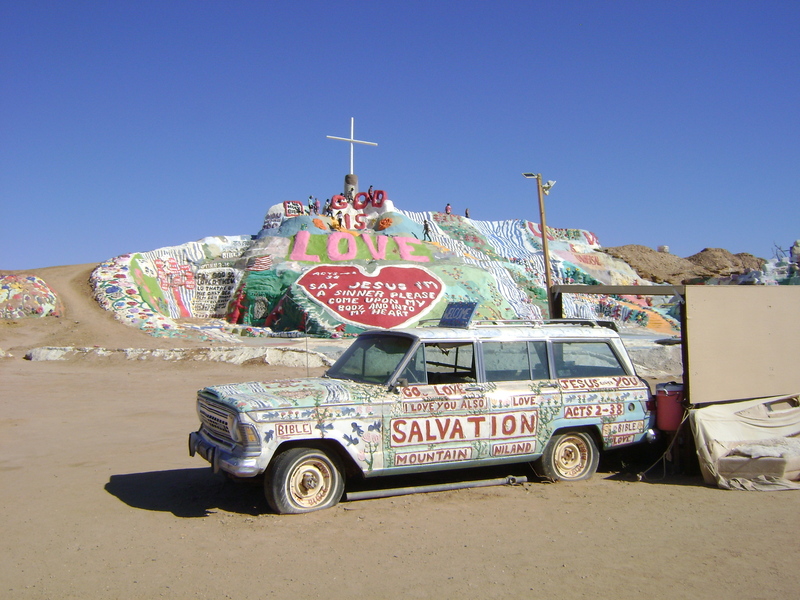 I was told that if I was going to the Salton Sea that I must check out Slab City, just past Salvation Mountain(see my post here). I was told to go at night because that is when it is most active. Everyone comes outside to sell their items, talk to their neighbors, and meet new people. I decided to check it out in the daytime to see how safe I felt first since I was traveling alone and it is really out in the middle of nowhere. 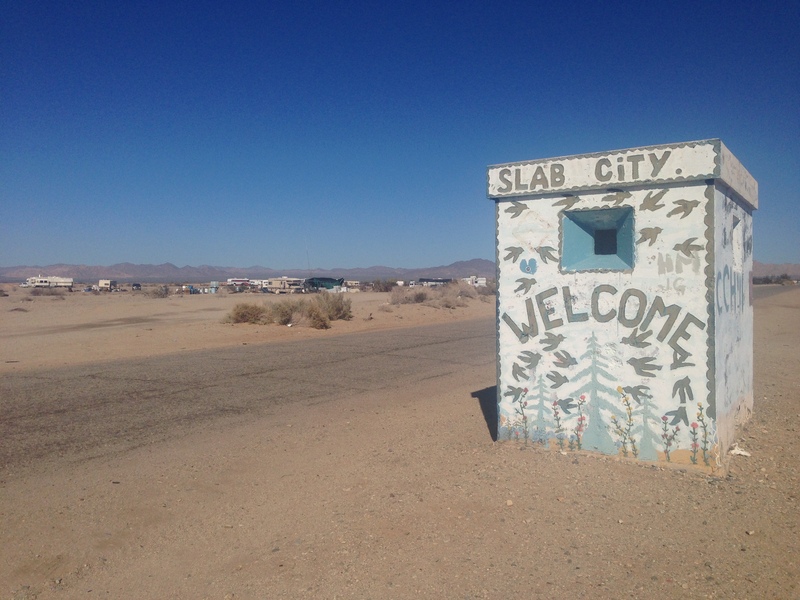 As I drove up I was amused by the Slab City Welcome post. I walked around it trying to get a good picture with some of the city behind it. 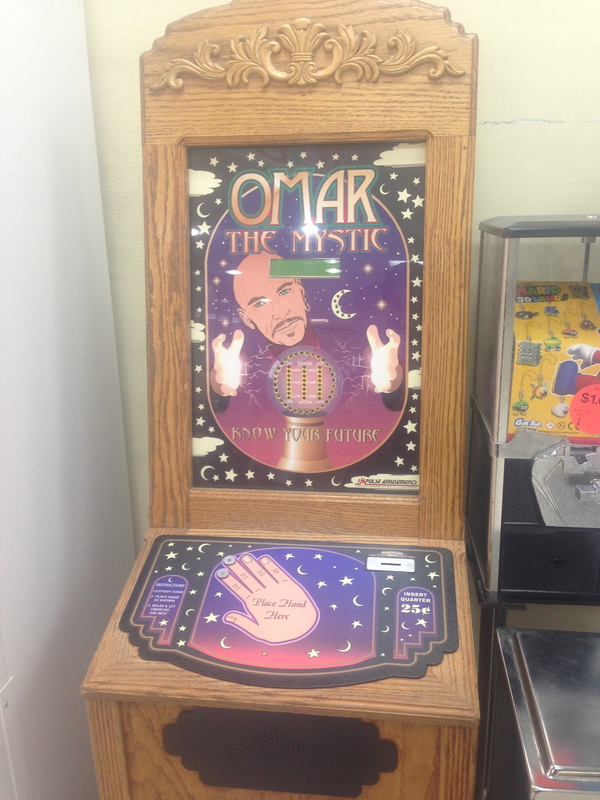 Then I stepped inside it to see if there was anything I was missing. Wrong choice! It was disgusting, filled with trash and smelled of pee. I won’t do that again. I drove down farther into the city. 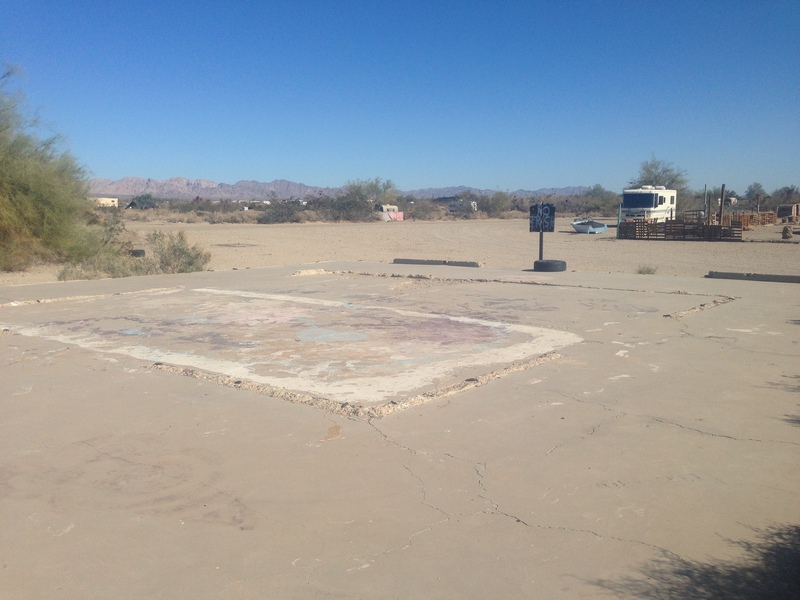 It was filled of concrete slabs where people had set up their trailers, but they were far from the road. I passed by a small church and stopped my car by the Bedazzeled Truck. It was covered in shiny metal objects and just weird other things. Tires, toys, signs, steering wheels, anything you can think of. 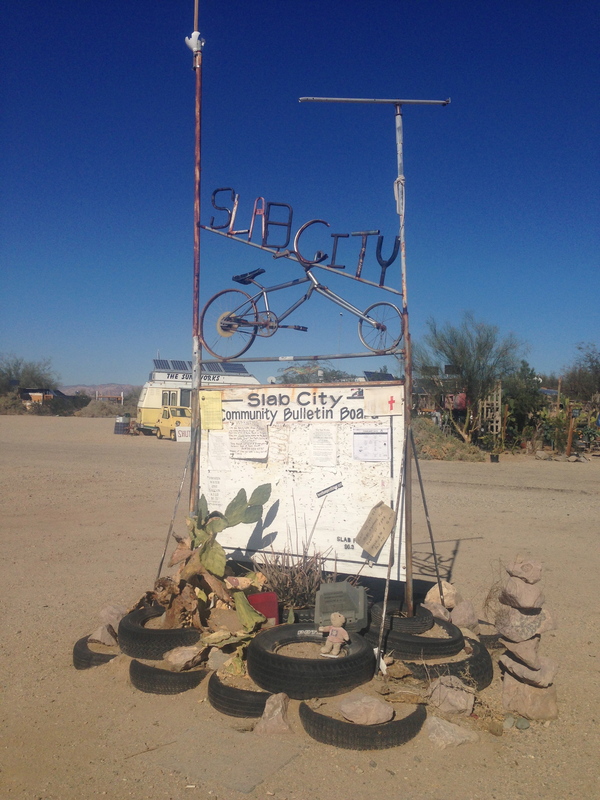 I ran across the road to the Slab City bike sign and took a picture. That’s when I started to get this strange feeling that I was being watched. The trailer next to me had a sign “Beware of Dog” and the other trailer had a sign saying something that was off-putting. I thought to myself, I don’t need an encounter today and quickly headed back to my car, taking one more picture along the way. I jumped into my safe vehicle and still intrigued by the city headed in a little further. I couldn’t remember if there was anything else I had wanted to see. Maybe it was a rainbow painted bus? I turned into an art area a viewed the shop from my car window. Then, letting my nerves get the best of me I decided it was time for me to leave. It was so strange. No one was out except an occasional biker that would appear out of nowhere, quickly passed by, and then go out of sight again. I felt like I had walked into a scene from a horror movie. On my way out the a lady that I had noticed setting up a table with I’m guessing were some items to sell waved to me. I was taken aback and tried to wave back with a smile in response. And then I was out. 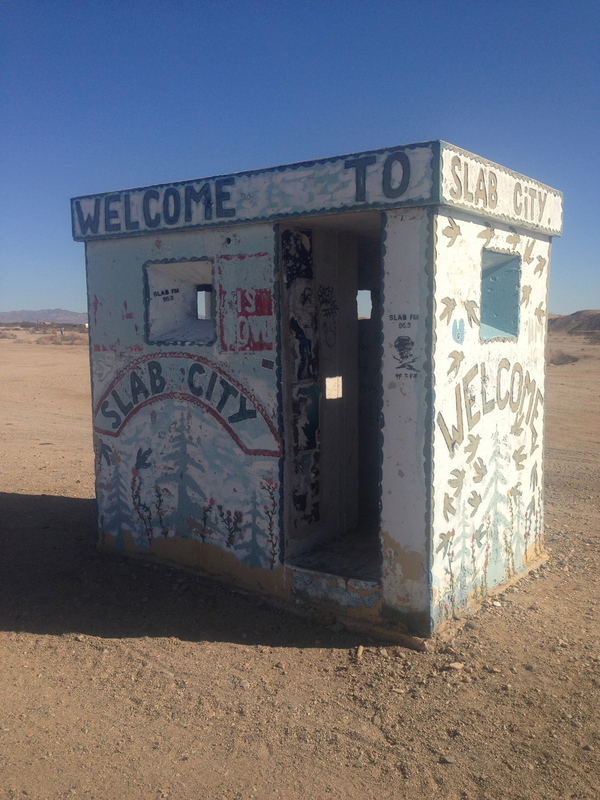 I didn’t return to Slab City that night. I had enough for one day. Maybe another day I will return and experience the nighttime city, but for now I was happy to just enjoy it during the daytime. 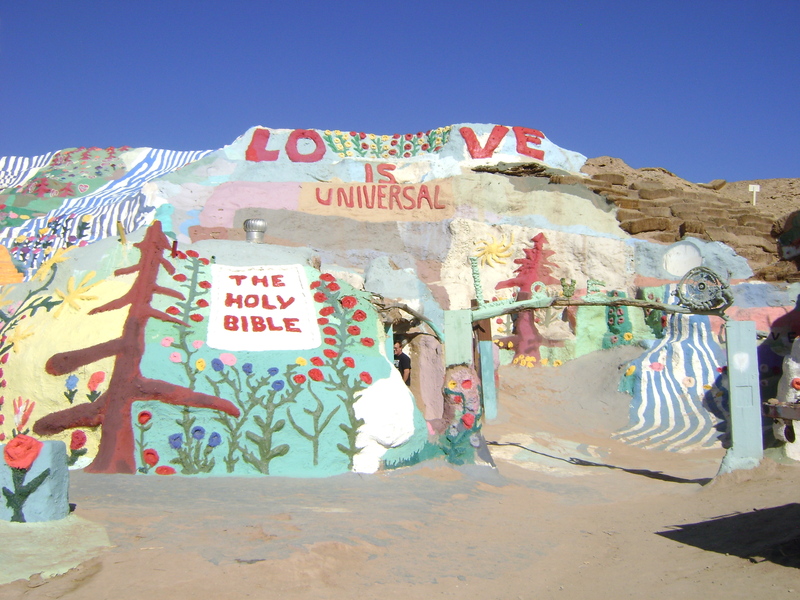 Leonard Knight created Salvation Mountain. 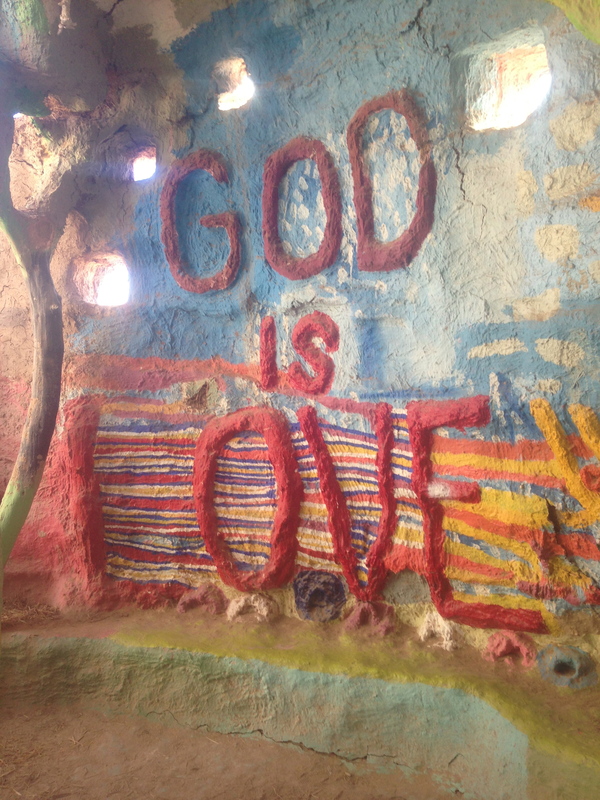 On a life altering experience on a trip to San Diego in 1967 he discovered God. In 1970 after seeing a hot air balloon pass over Burlington he thought it would be the perfect way to share his love for God and get people to see the Sinner’s prayer. He finally came across his own a hot air balloon after 10 years of prayer, but unfortunately his idea was too ambitious and his balloon’s stitching began to rot and fail before he could get it fully inflated. 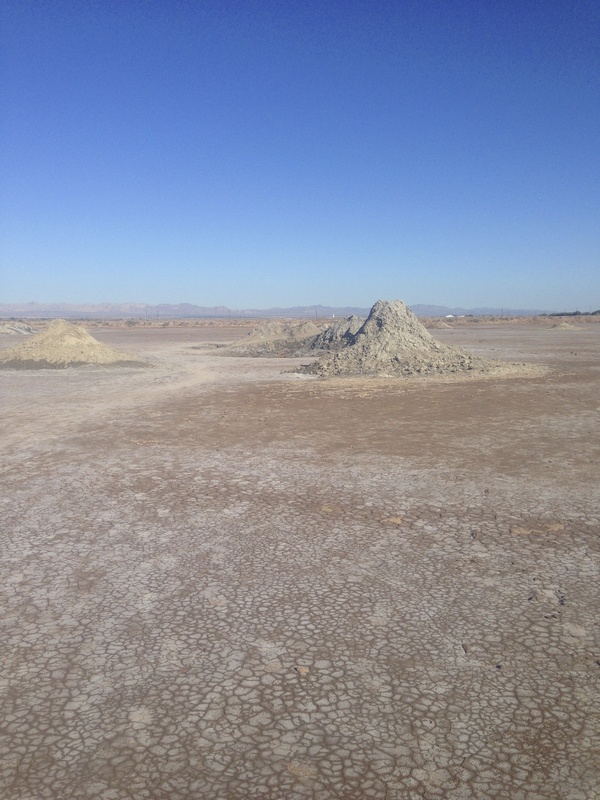 In an attempt to leave something behind before he left Niland, CA in 1984 he started construction on a small monument. What was only supposed to be one week of work slowly turned into weeks, months and years. 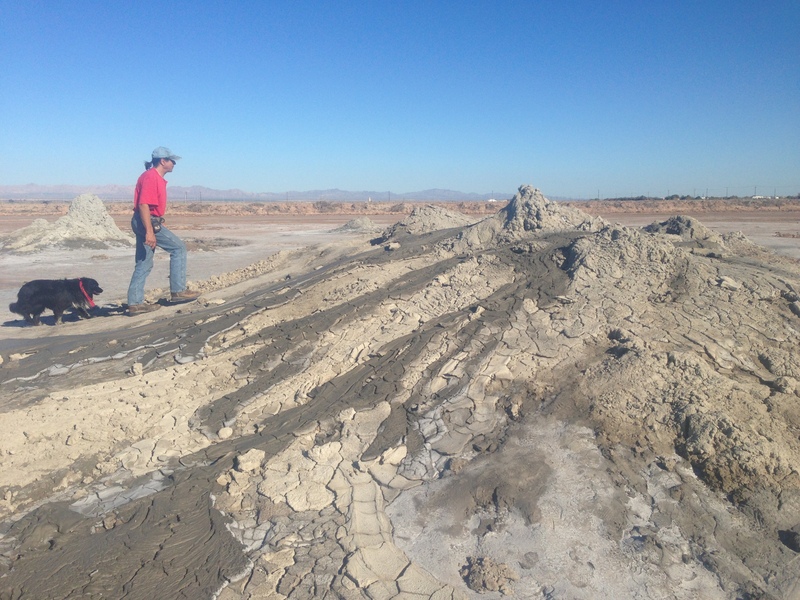 After 4 years of work Knight’s unstable cement and sand mountain fell. 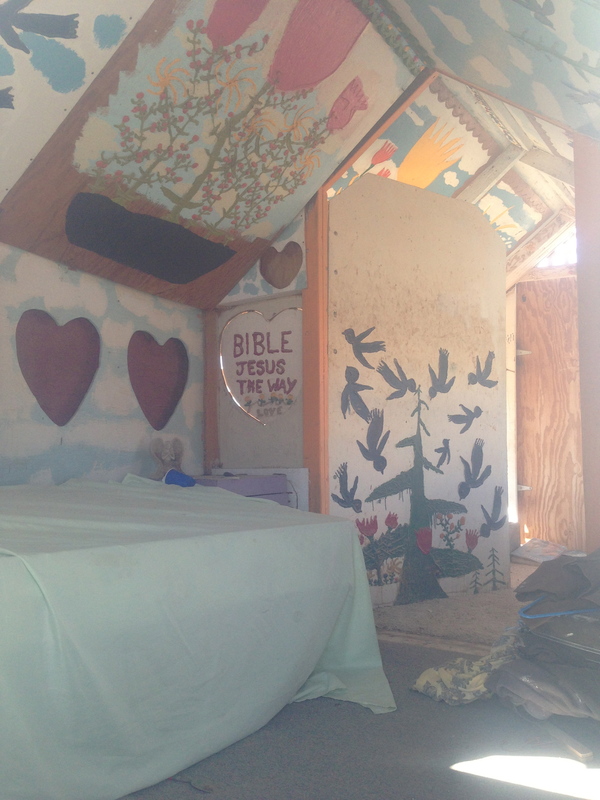 Instead of getting upset, he thanked God for letting him know that his structure was unsafe and started over. 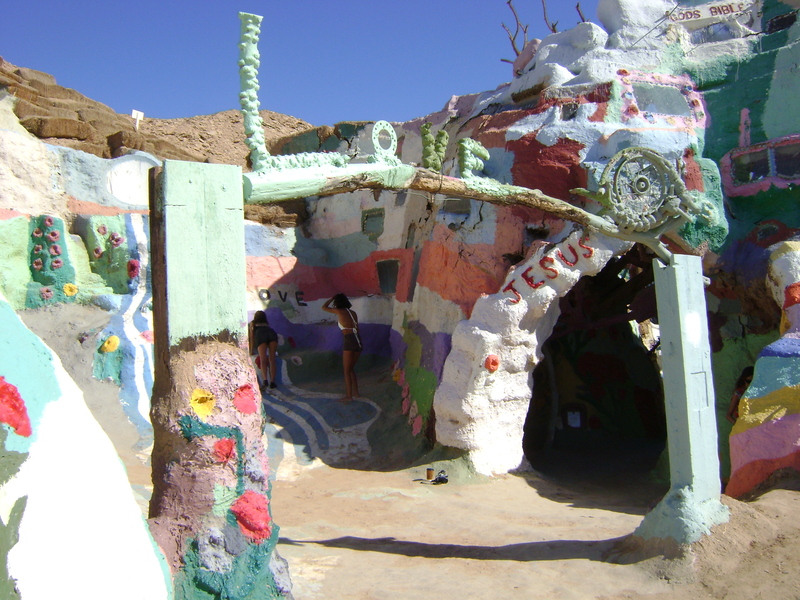 This time he molded adobe clay mixed with straw into the mountain for a much more secure build that has become the Salvation Mountain we know today. 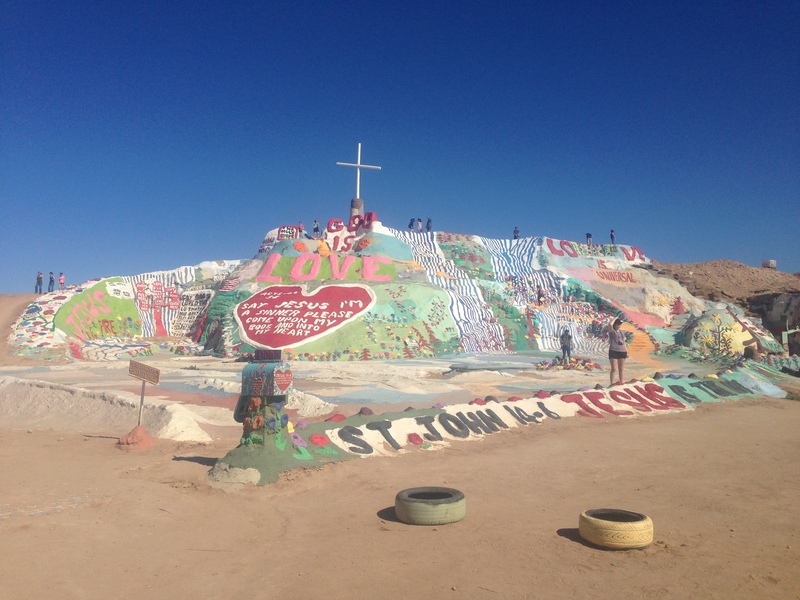 When I arrived, I was impressed by the magnitude and size of Salvation Mountain. 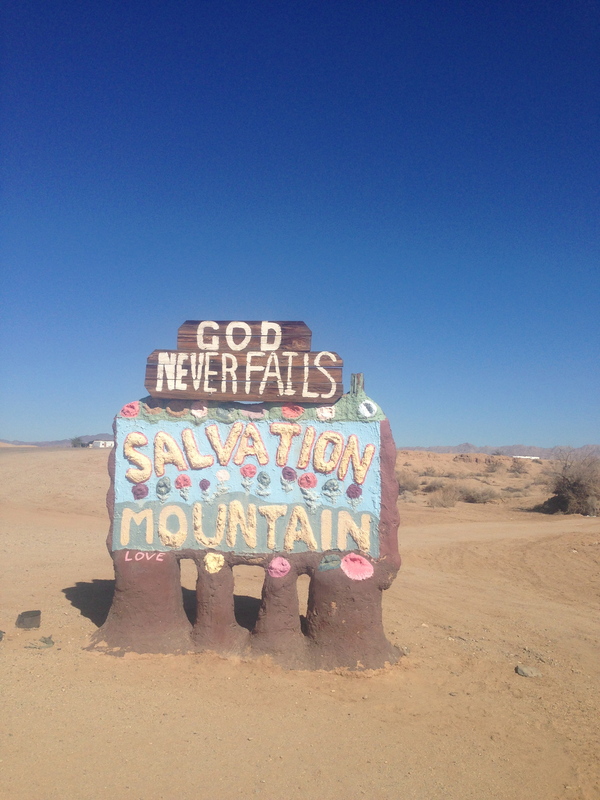 I drove passed the sign, into the parking area and began to wander around, reading the quotes on the mountain sides, cars, trucks, and everything else. The one quote that stuck with me the most was “Love is Universal.” It doesn’t matter who you are, what you do, who you know, or what you look like, it is true Love is Universal. 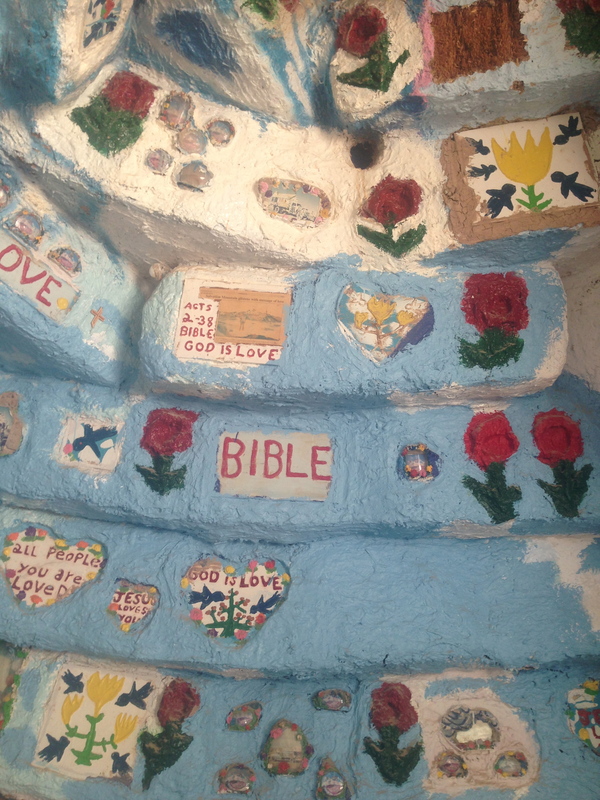 Salvation Mountain is painted with many different bible passages, bold colors, and a yellow pathway to the top that you can still use today. 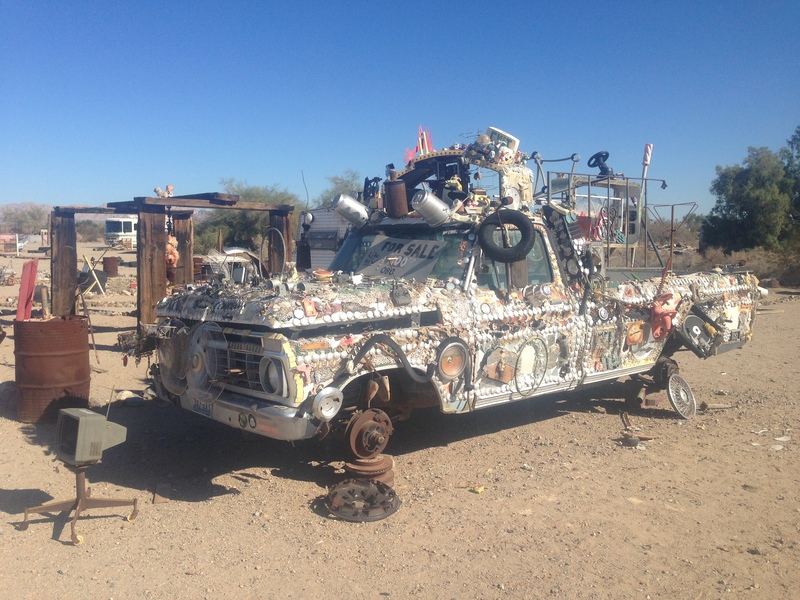 Knight lived there and would paint the mountain, nearby cars, and the “Museum” all by himself. 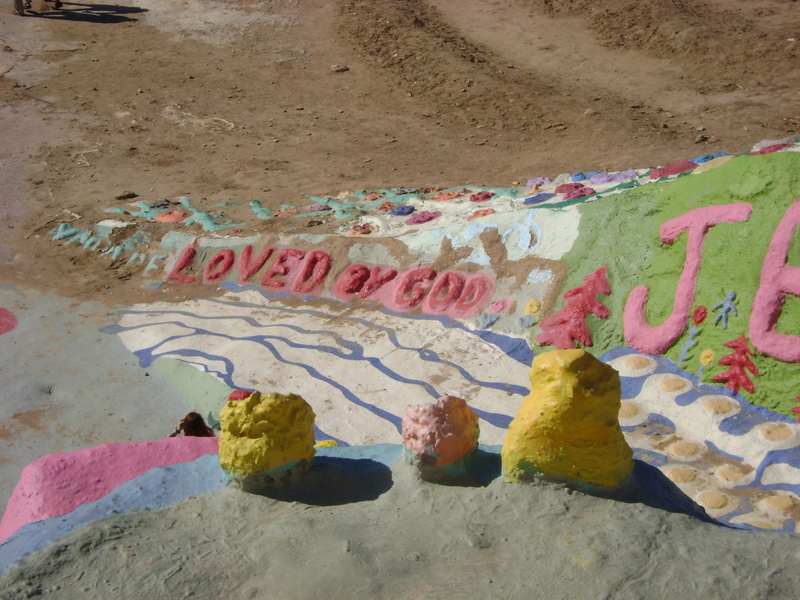 He passed away a year ago as of Feb. 10th and now the organization, Salvation Mountain Inc, does their best to keep the mountain in the best condition possible. The painting helps to reduce erosion from the elements, aids in patchwork repairs, and gives the mountain it’s beautiful, bright coloration. Most of the paint has been donated by people of many different walks of life, starting as far back as Leonard Knight’s first attempt and continuing through today. Several years ago Knight decided to add the “Museum,” modeled after his original hot air balloon. 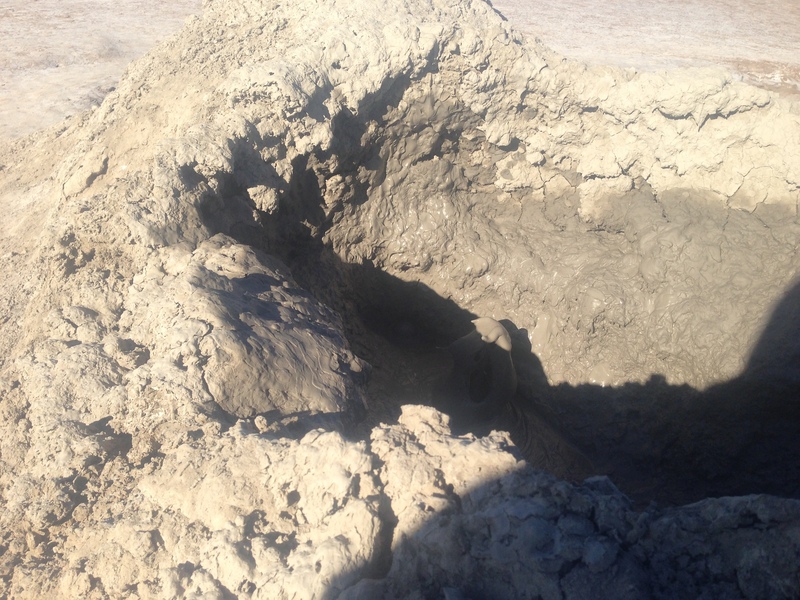 It includes several large domed areas supported by trees, adobe clay, hay, and old tires. The day I went, a musician was softly playing his guitar in the shade of the tall structure adding quite the ambiance to the place. It felt like Love was completely surrounding me, in the true Knight fashion. 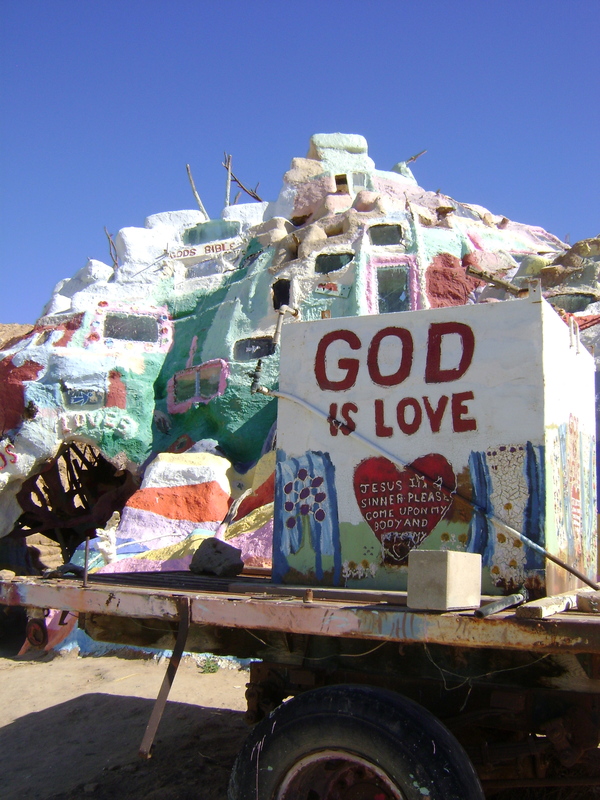 Salvation Mountain is Knight’s tribute and gift to the world, showing people everywhere more love, compassion and bringing a more peaceful and harmonious existence to this world. 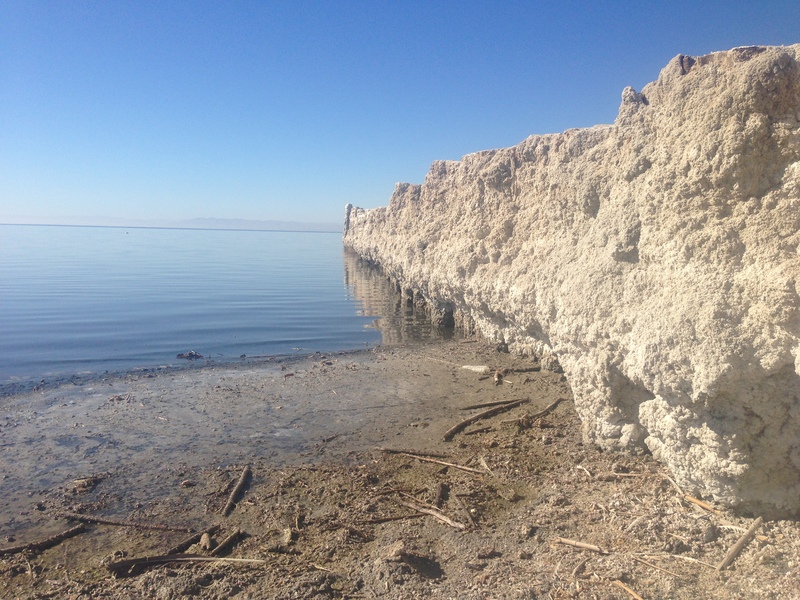 At some point on your trip to Salton Sea you are going to have to stop and eat some food. 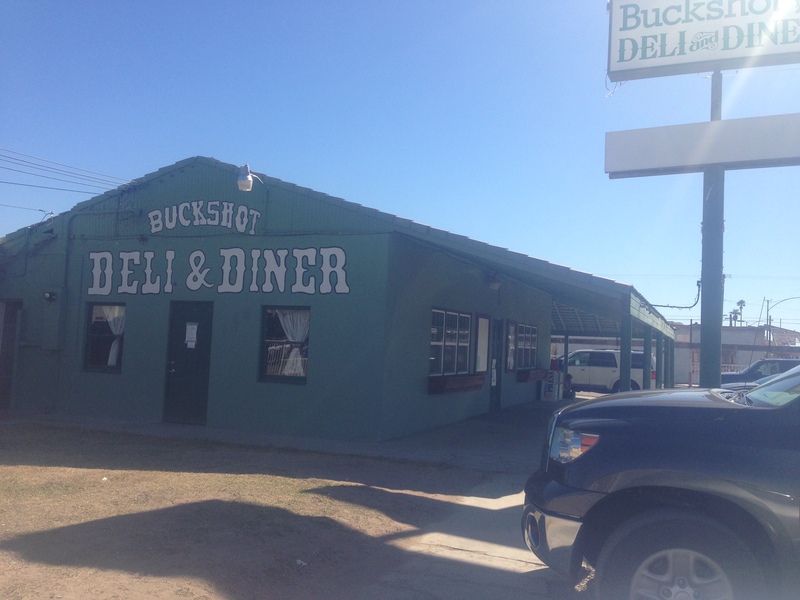 There are not many places on the west, so Buckshot Deli & Diner is a safe bet for something that isn’t super expensive and is also decent tasting. 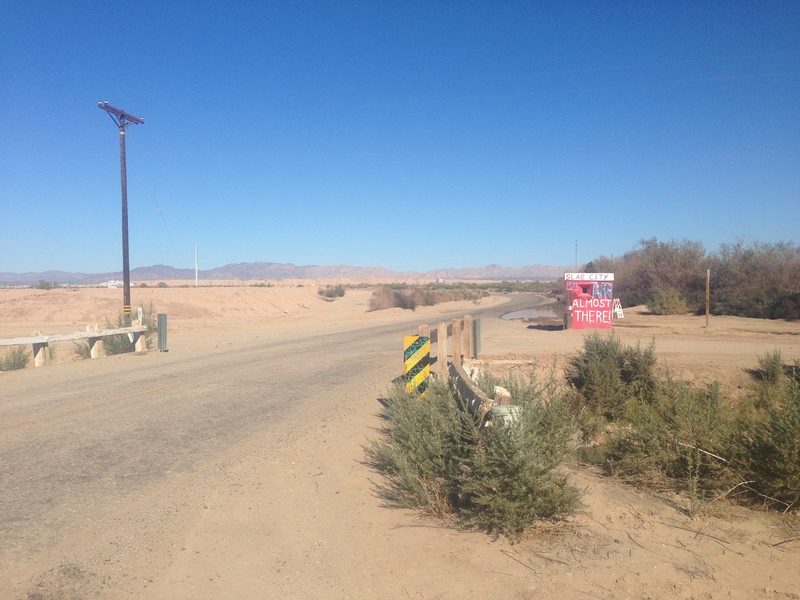 I stopped at Buckshot Deli & Diner in between my Salt Creek and Salvation Mountain adventures. I wasn’t too hungry so I only ordered a sandwich. I have to say it was good because while I’m not a super picky eater I probably should have spent a little more time looking at the menu to make sure that mayonnaise and tomatoes weren’t part of the order. Unfortunate for me they were. However, the fries were great! I was in a rush to move my day along and felt like the place was a little slow for my liking considering there weren’t that many people there, but other than that it was ok. I probably would have enjoyed it more with someone to talk to or if I had sat at the bar. All in all, it’s really the only place over there so while I can’t give it a super great rating I can’t give it a horrible one either. If you are a local and will possibly be eating there again, enter for their free meal on them promotion going on. Sign up for their email list on the back of your receipt. They pick a winner everyday! 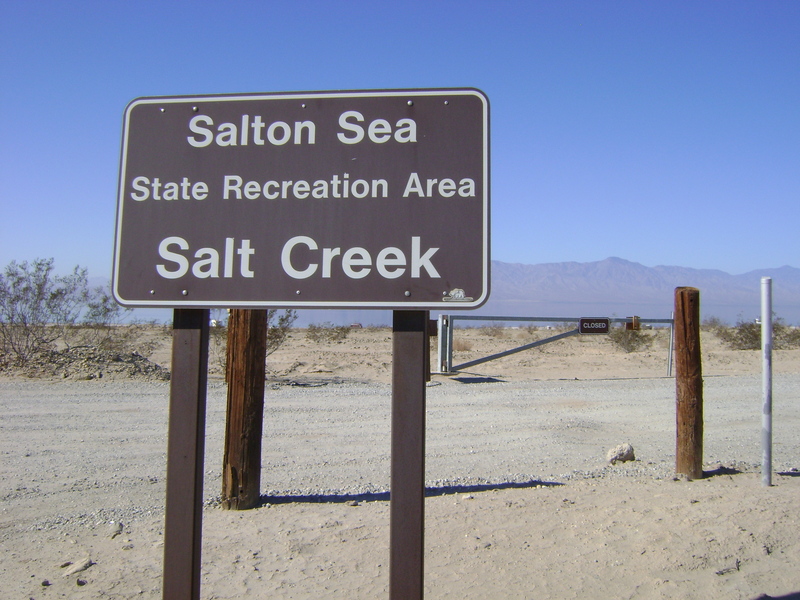 I was searching for the main Salton Sea State Recreation Area and instead stumbled upon Salt Creek. It looked like such an alluring beach from the road. Birds covered the water’s edge and I couldn’t resist spending a little time exploring. Unlike other state run facilities there is no person here to take your money. A $5 fee for day parking or I think it was $10 for camping is required based on the honor system (and maybe an occasional ranger?) I took an envelop, filled out the card and deposited my money into the slot. I was so giddy by feeling so unrestricted and free. This beach is too cute! Salt Creek was pretty empty, with a scarce trailer or tent set up along the parking area and a few lone strangers walking the beach. 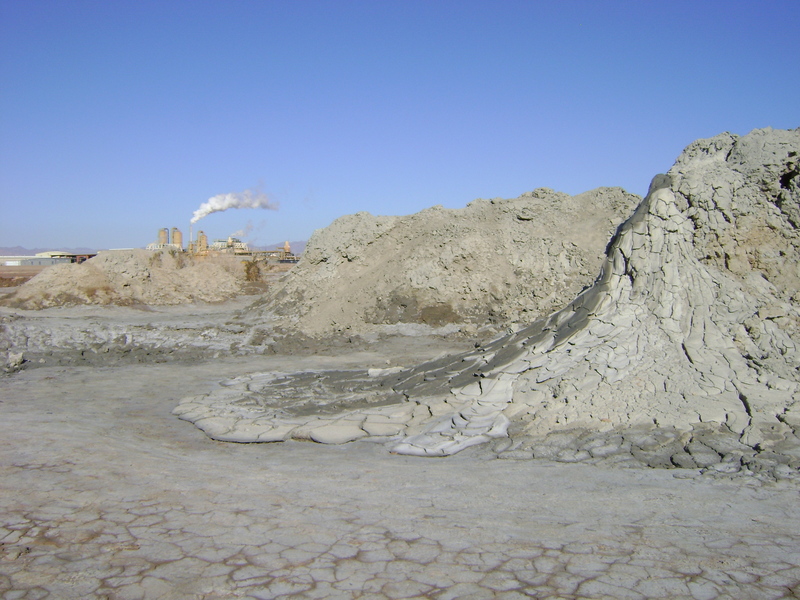 As I walked closer to the water I was intrigued by the strange crumbling and crinkling sounds the ground made under my feet. 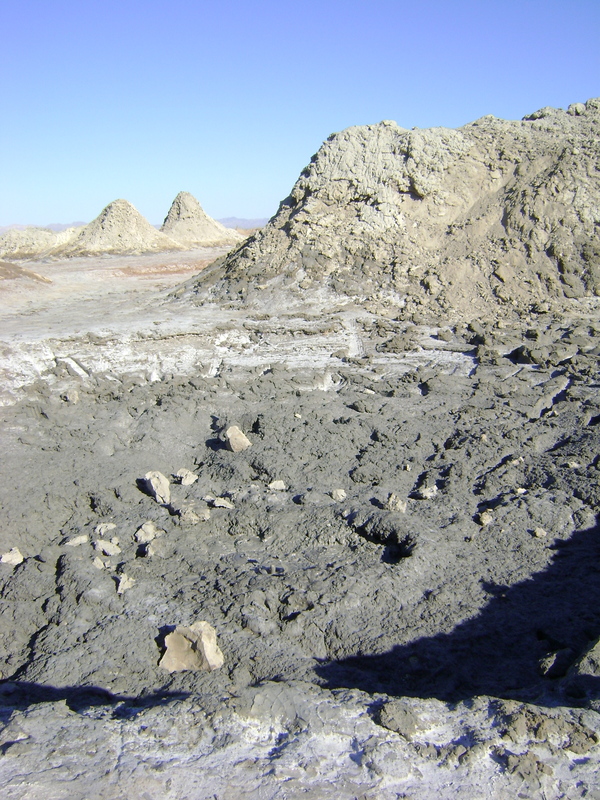 It had gone from packed, dried, cracked dirt to brown sand to white crushed fish bones to little white circular bubbles all within about 20 feet. My footsteps sunk deep into the bubbles, which I can only believe were vertebrates and I stopped to see if my weight had crushed any as I passed. So odd, they seemed to just roll out of the way. I reached down to examine them further and realized they were quite fragile, able to be crushed by a simple squeeze between my thumb and forefinger. Baffled, I continued on toward the water. 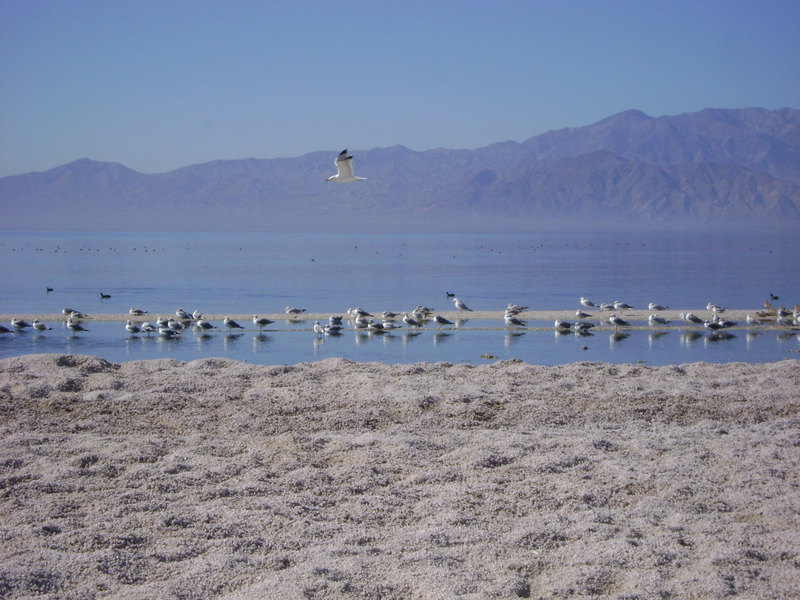 As I got closer to the water’s edge and the many beautiful birds brown muck rose from beneath the bubbles in small patches. I accidentally stepped in it and it clung to my shoe like goo. It was quite gross and I tried to use some bubbles to partially wipe it away, even more off-putting. I continued onto the water’s edge and while I don’t bird watch or know the different names of the those that inhabited that stretch of beach it was still quite a sight which I greatly enjoyed. 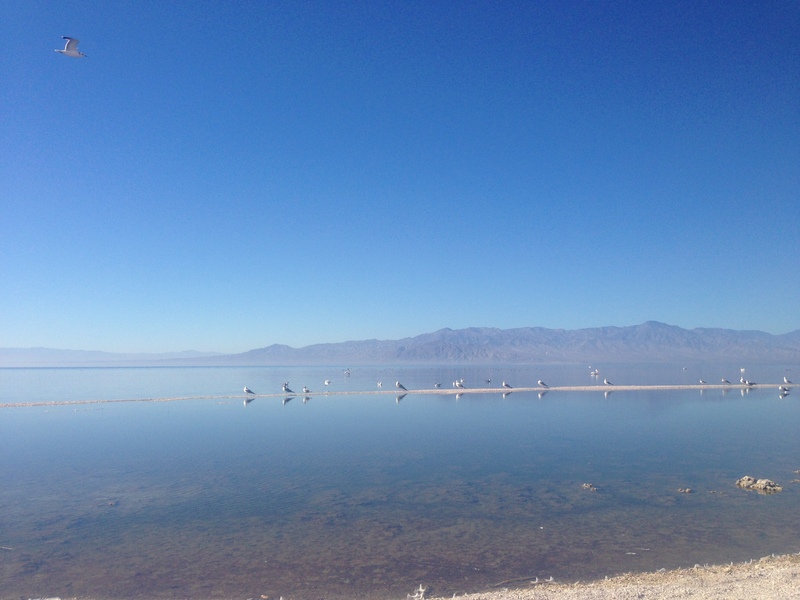 I sat there watching the birds sit along the water’s edge and glide above the surface sometimes diving in with a subtle splash for a while and eventually headed back to my car. 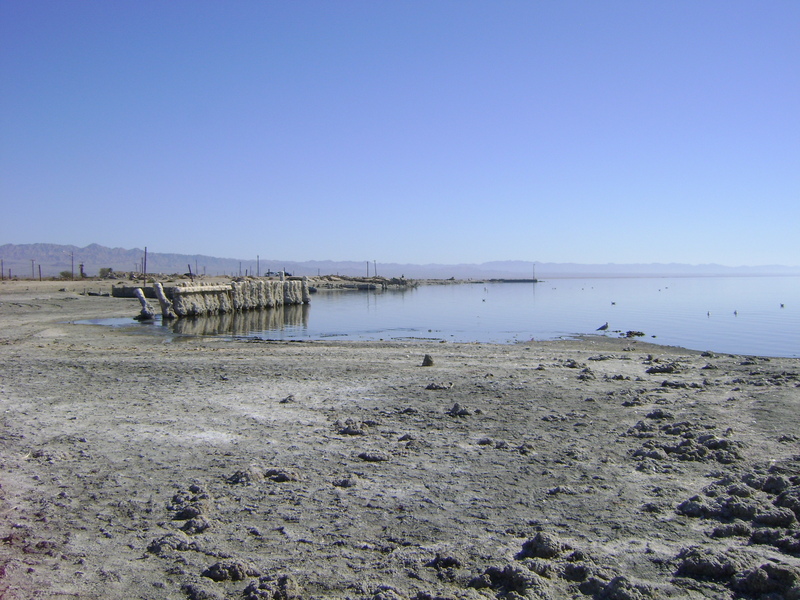 I remembered people saying that the smell of the Salton Sea was horrible, wretched, and the worse that had ever smelled. Maybe I went at a good time or maybe my nose isn’t as sensitive as theirs, but honestly while I was there it really smelled no worse than a day at low tide on the Old Saybrook docks where my childhood summers were spent. The whole time I was wondering, where is that awful smell everyone spoke of, but deep down was extremely happy that I didn’t have to experience it. Score one for me! 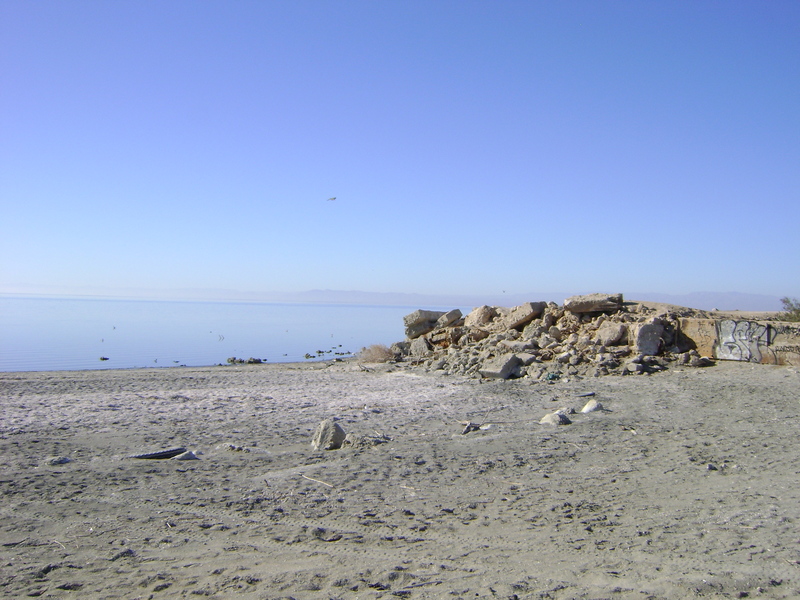 In the morning on my first day of my Salton Sea trip I excitedly drove up the west coast and made my first stop at Bombay Beach. 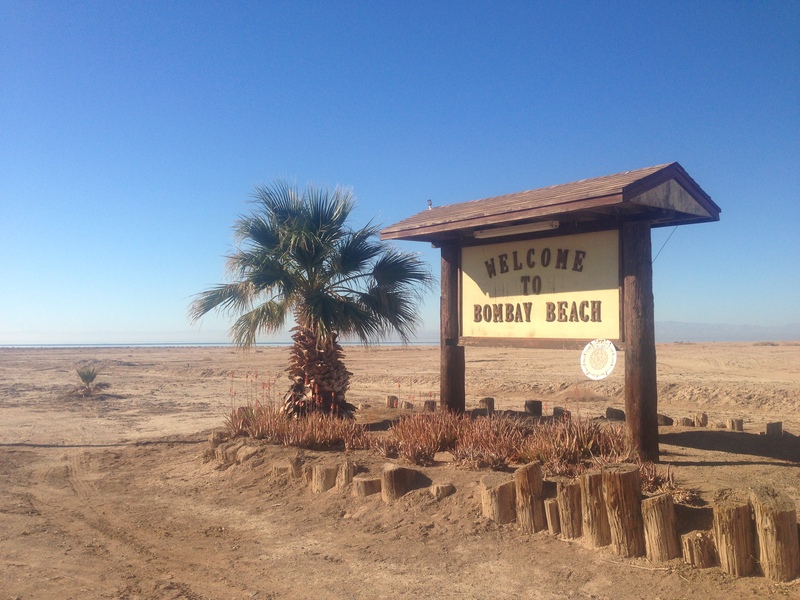 I wasn’t exactly sure where I was going, but I reached a sign that clearly labeled Bombay Beach and drove into the little town toward the water. 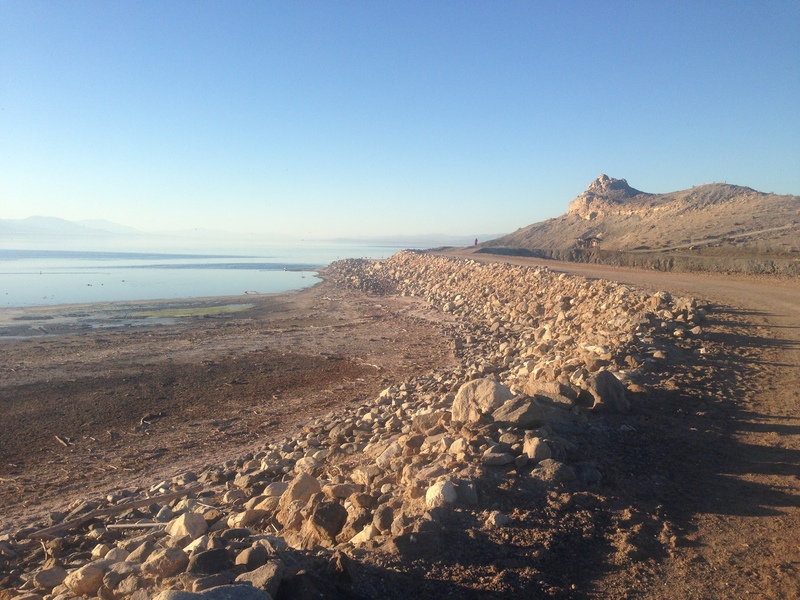 I came to the only entrance which allows you to drive to the shoreline and made my way up the slight incline. I parked my car stepped out and took it in. 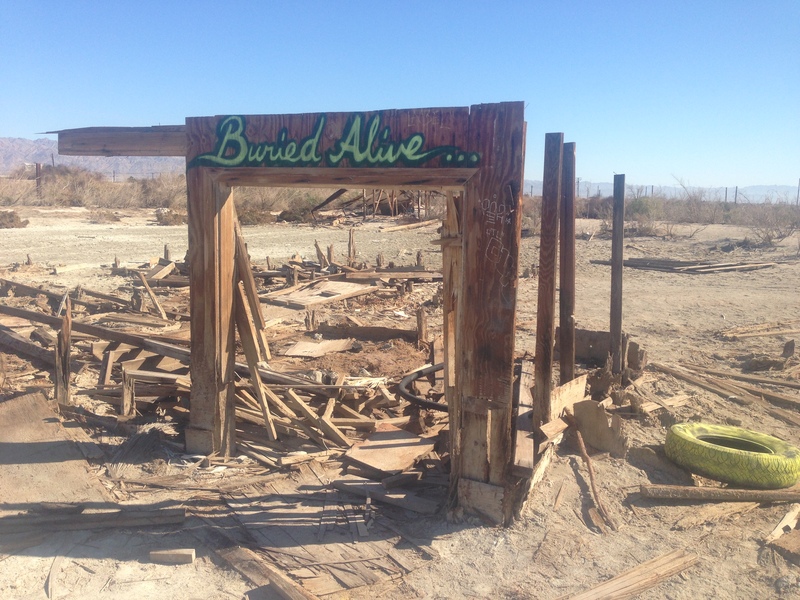 I was there, Bombay Beach, and if I hadn’t already known I would have been surprised by it being in ruins. 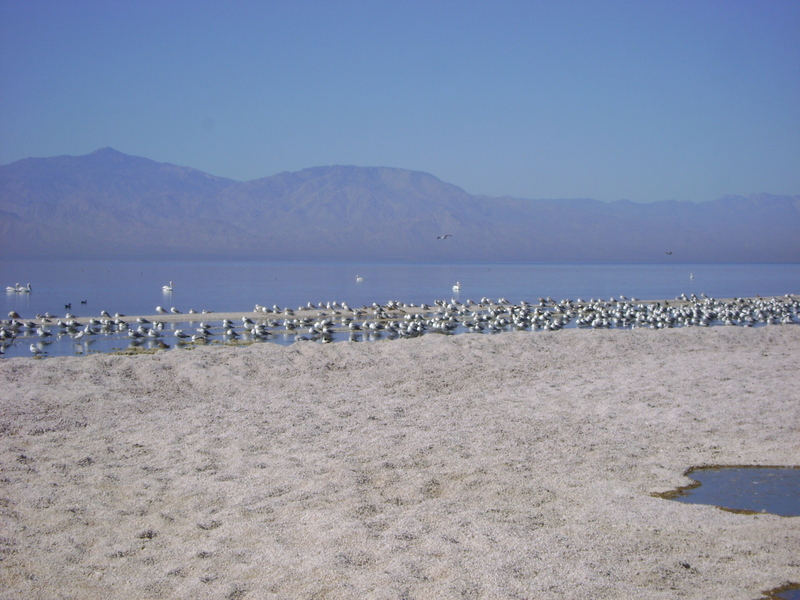 It is hard to imagine that this beach used to be a popular vacation spot along the Salton Sea in the 1950’s and 1960’s. With resort complete with a pool and a golf course, docks that reached out into the sea filled with sailboats and motorboats, and a beach cluttered with beach umbrellas and people sunbathing and swimming it must have been an amazing place to go. 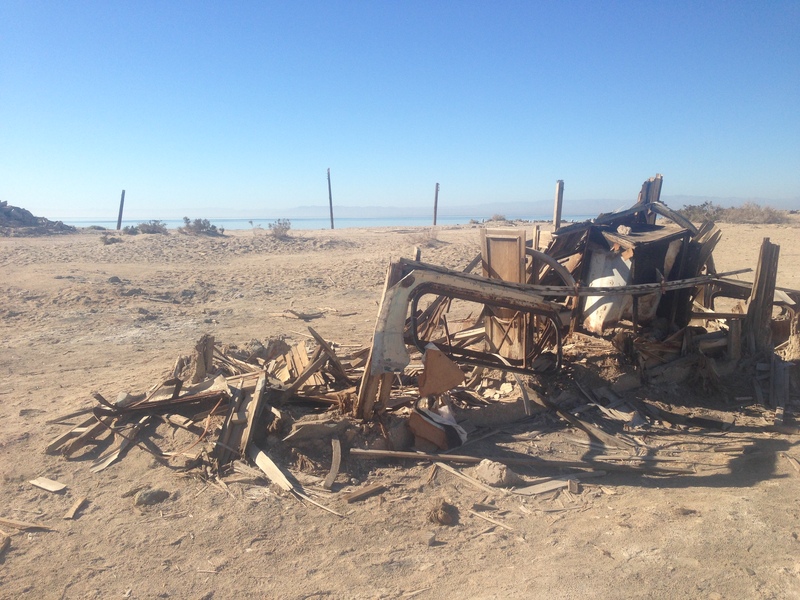 Now, the resort is completely gone, the dock has been removed with only the pilings left and it would be an extremely rare sight to see anyone sunbathing on the fish bone covered beach or swimming in the brown goo bottom covered sea. 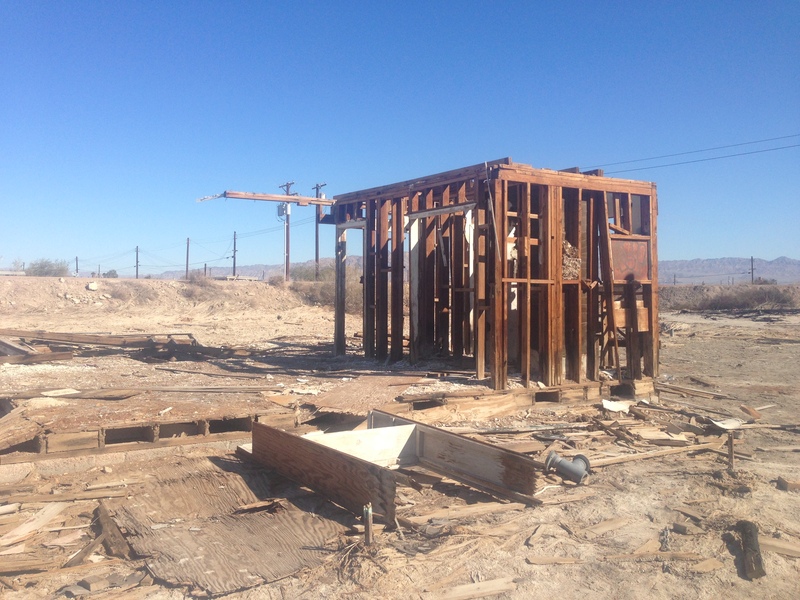 Bombay Beach is just bare, stark and uninhabited. 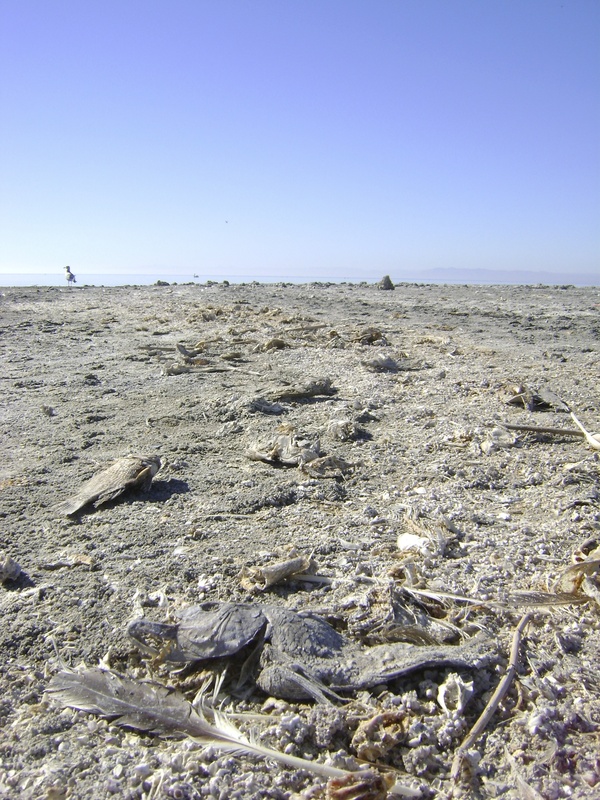 It is a fact that every year the Salton Sea shrinks and its salinity increases. 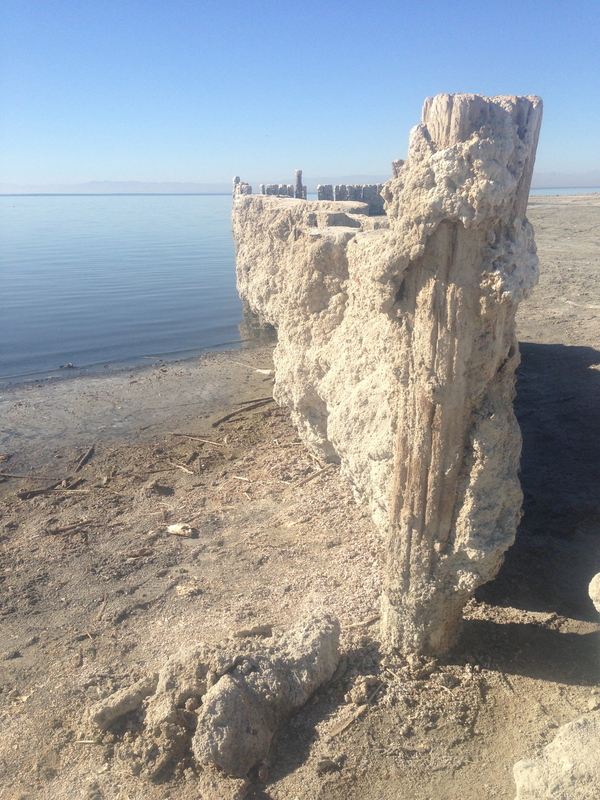 The pilings along the shore at Bombay Beach are a clear sign of both. 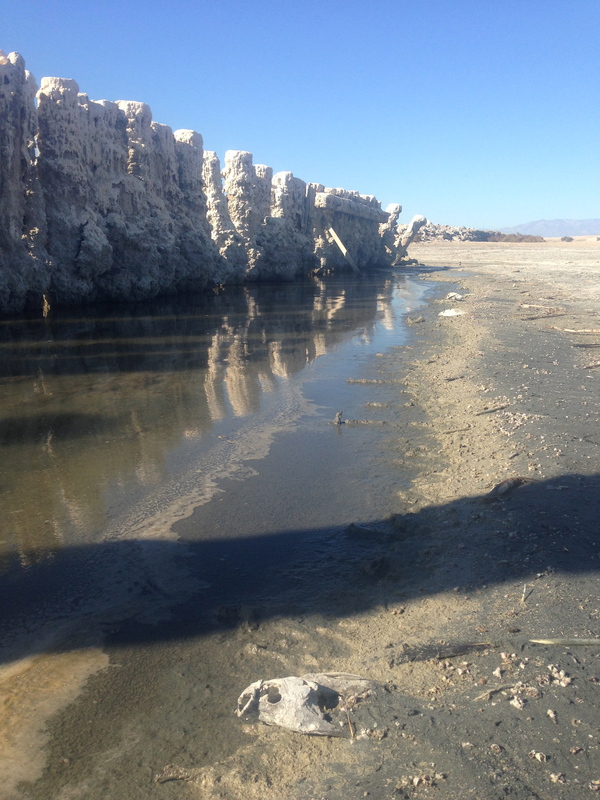 The water seems to just reach the edge of them on the day I visited. 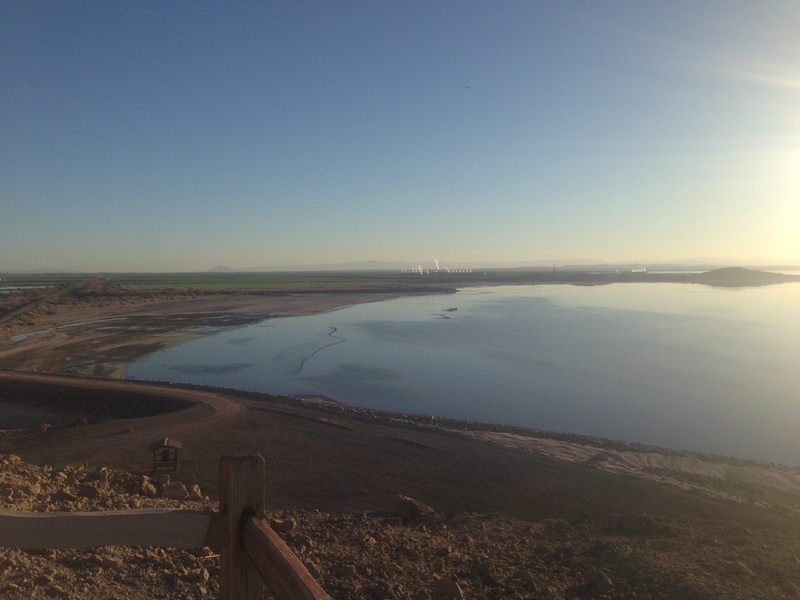 Maybe with some rain it will rise a bit, but I can’t imagine the skies producing as much rain as would be needed to bring the water back to its original height. 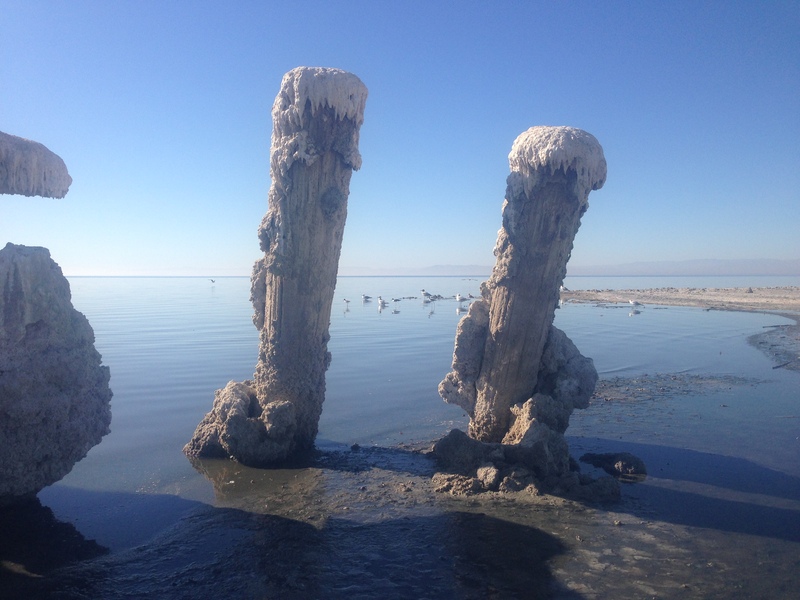 I was also intrigued by the white residue that has been left on the pilings by the sea and can only believe that they have been calcified by the salty water. I moved away from the shore and into what I can only call the ruins. You can find anything there. 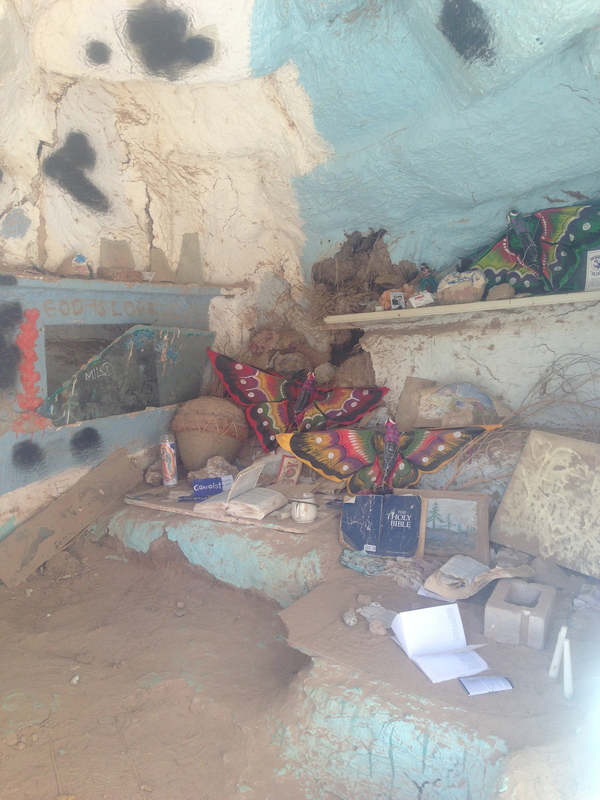 The area is scattered with tires, toilets, a piano, and items that the residents clearly left behind because they were too big to take with them. The most captivating ones are the trailers that look like they have been engulfed by the ground and an old rusted and crushed boat. 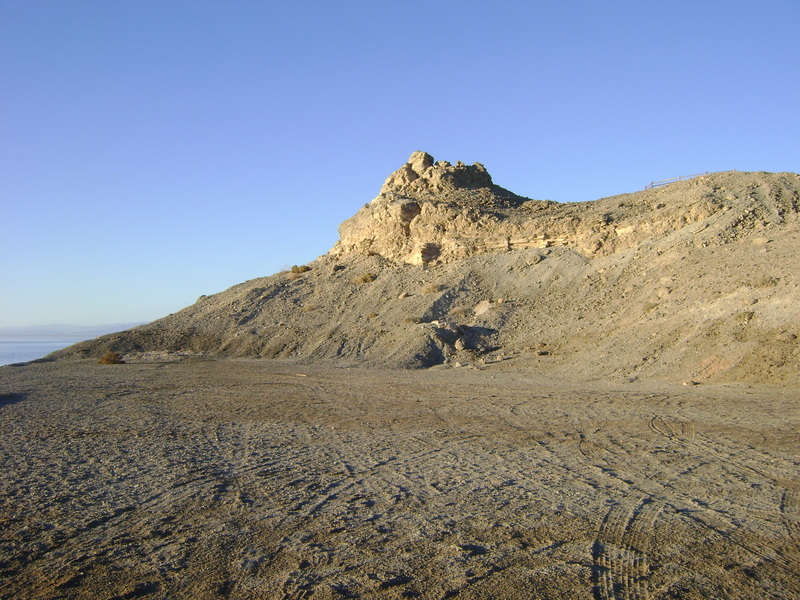 There are also foundations of buildings and a few that are almost still standing except without any walls. I finished my exploring and headed back to my car. 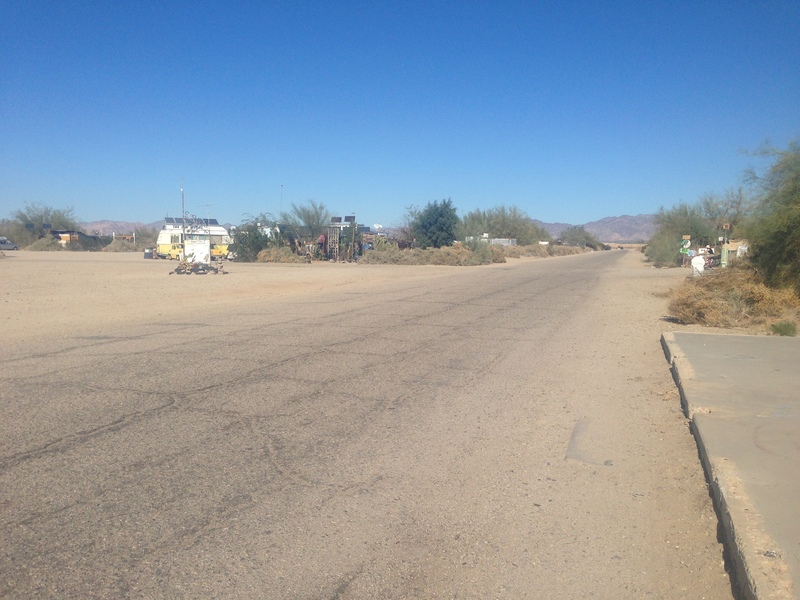 As I drove through the small town on my way out I noticed that there were many small rundown beach houses and trailers. 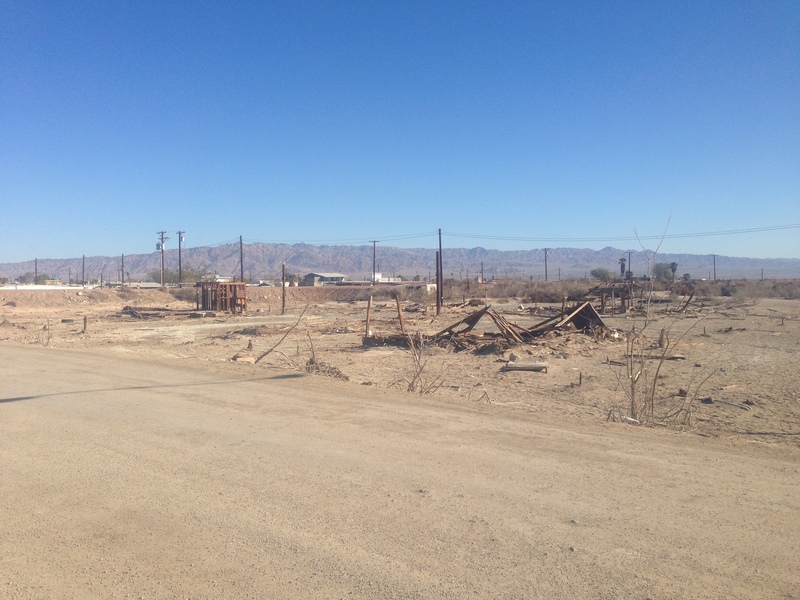 I wondered if the people lived here when the community was thriving until now, what a story they would have to tell. 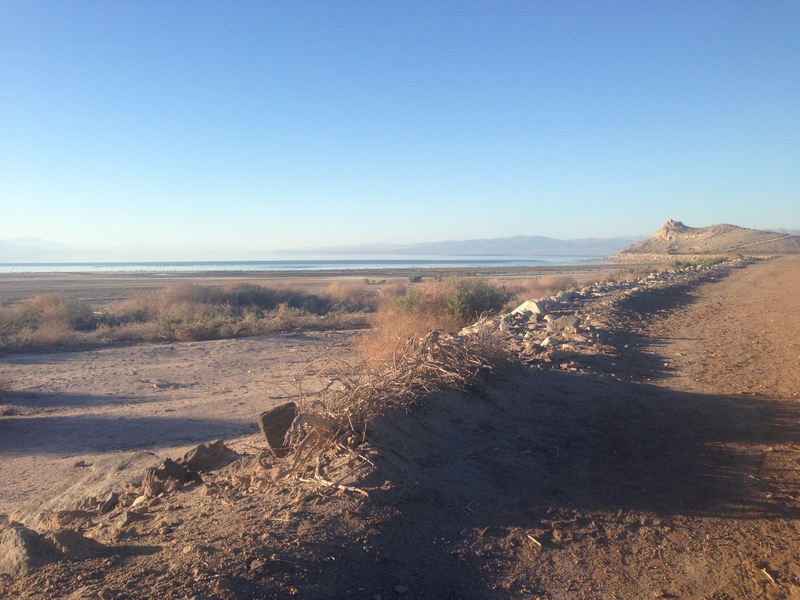 Late Saturday afternoon I headed out for my adventure to the Salton Sea. 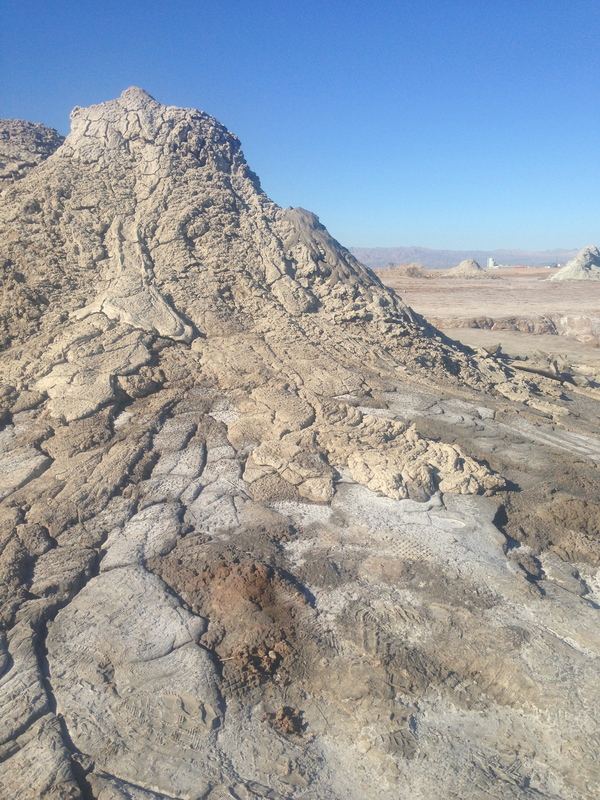 A few friends were skeptical, saying it isn’t someplace worth visiting, but I was still excited to check it out. I had a few places on my list of things to see, but didn’t really plan out much more. 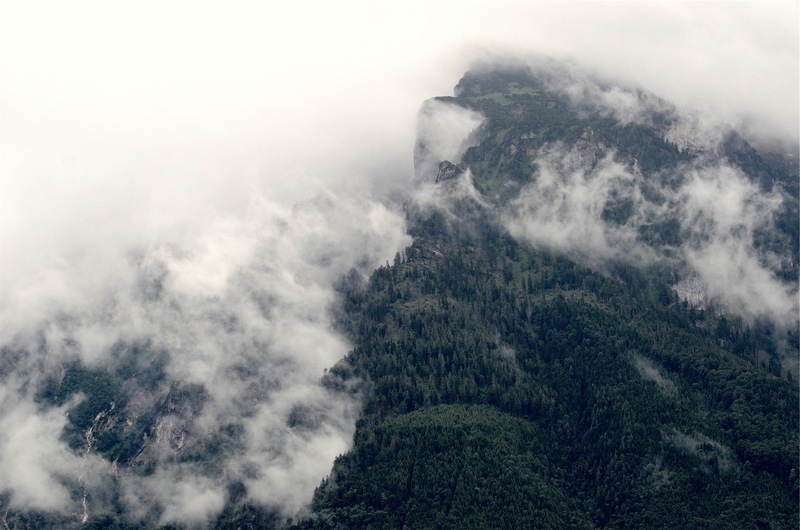 As I drove out of Los Angeles and away from the rain I saw the most amazing cloud and fog covered mountains. I could only believe that this was going to be a great trip. 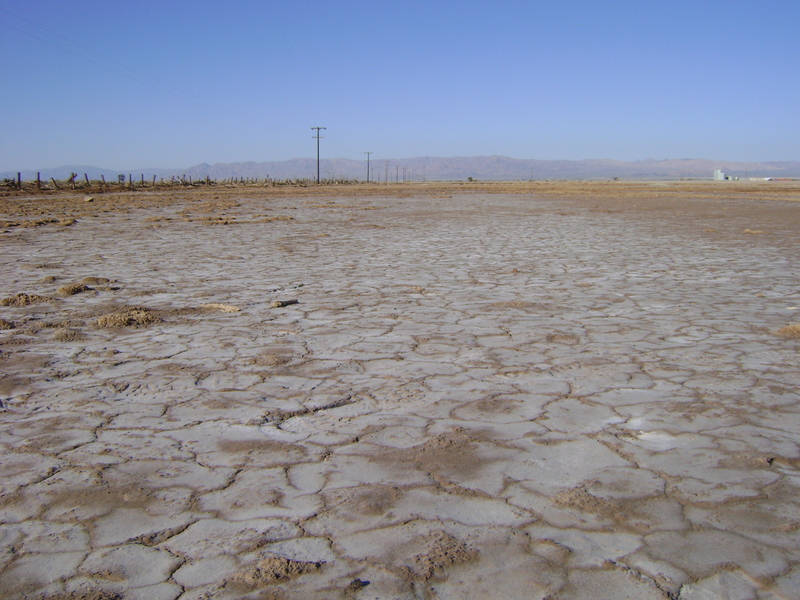 As I got further away from Los Angeles I pasted numerous turn offs for the places that I have planned to visit this year, a hiking spot in Pasadena, Big Bear Lake, Joshua Tree, Palm Springs, Desert Hot Springs, and even Cochella. As I got more and more excited about my trips I had to remind myself that I will get to those and to not get distracted by them. 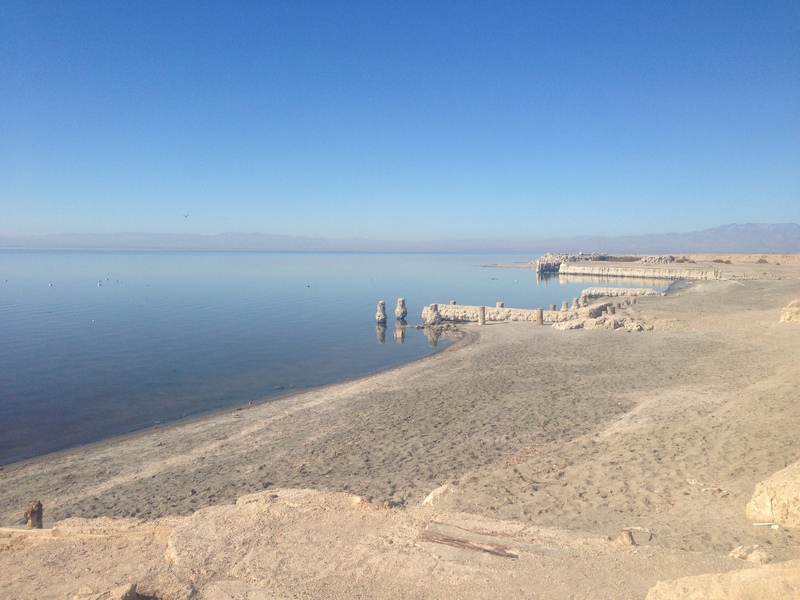 I convinced myself not to stop at each one along my drive and finally arrived at the Salton Sea. 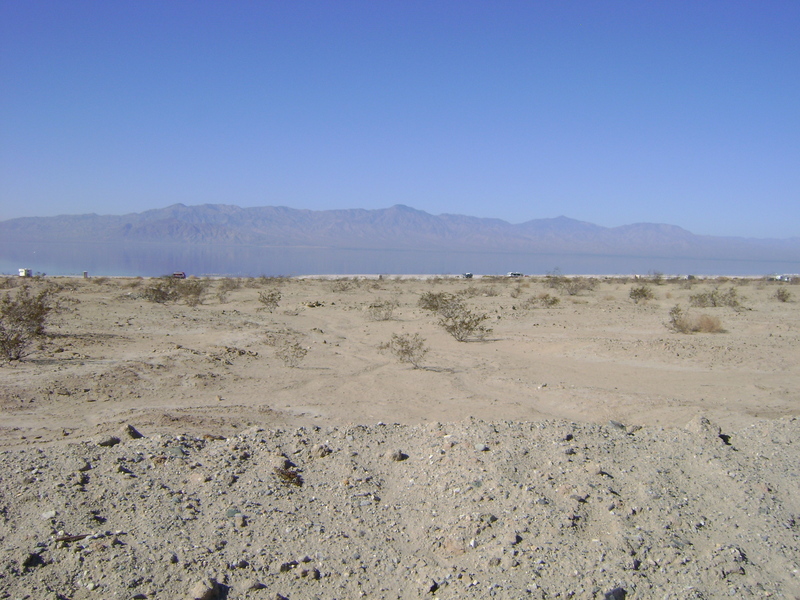 As I reached the Salton Sea and looked across the water I could see the lights from the small civilizations along the edges. It was captivating. Then the most stunning orange moon magically rose above the horizon. It was huge, almost completely full, and had the most captivating reflective glow off the water. 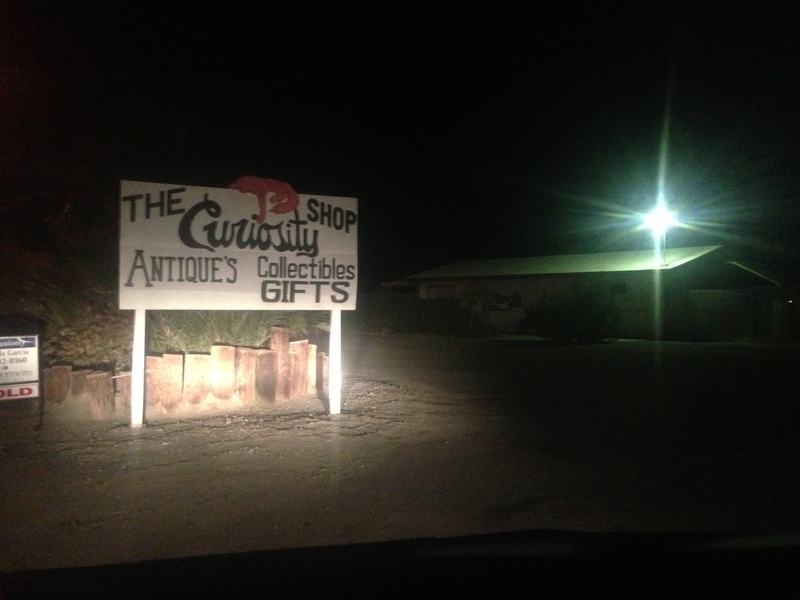 I tried to get closer to the water and stumbled into The Curiosity Shop. I couldn’t figure out how to get closer so I stopped to take a picture by the side of the road and stepped out of the car. I looked into the sky and could see a million little stars. It was quite impressive and no photo could ever capture that exquisite image that will forever be imprinted into my mind.